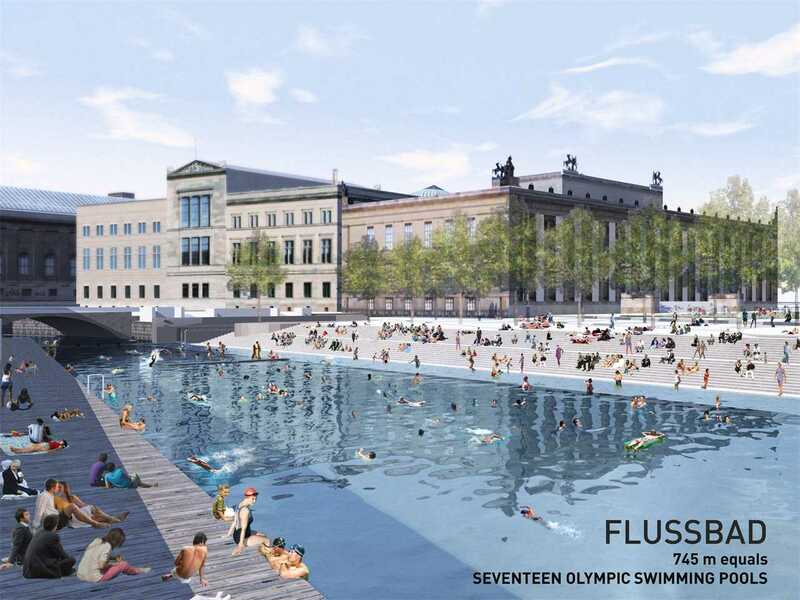 The project will include a terraced public space with areas for urban agriculture, a water management system, a public amphitheater, a music school, a small concert hall, sports facilities, public spaces and transport infrastructure. It will prevent further erosion and dangerous mudslides on the steep slopes and provide social and cultural infrastructure. 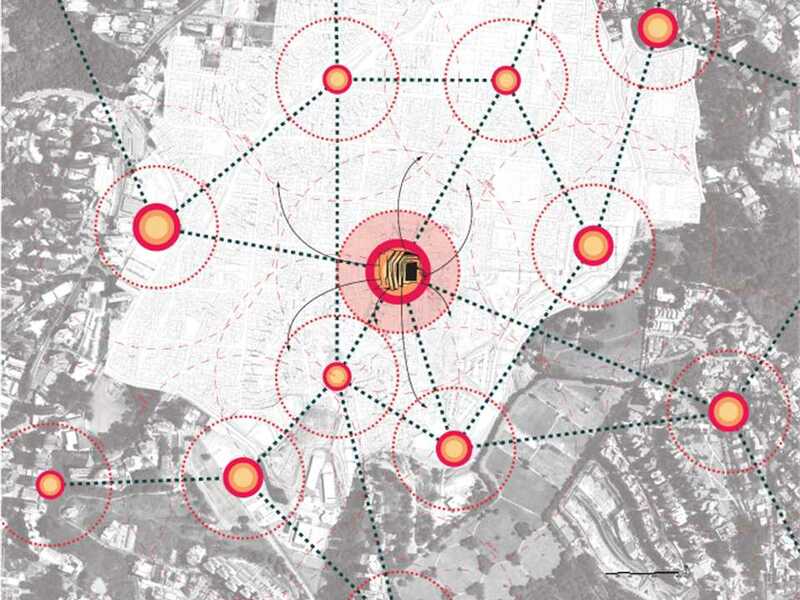 The planned site for the Urban remediation and civic infrastructure hub where the key challenges of the site are to be addressed through geological, architectural and social elements. 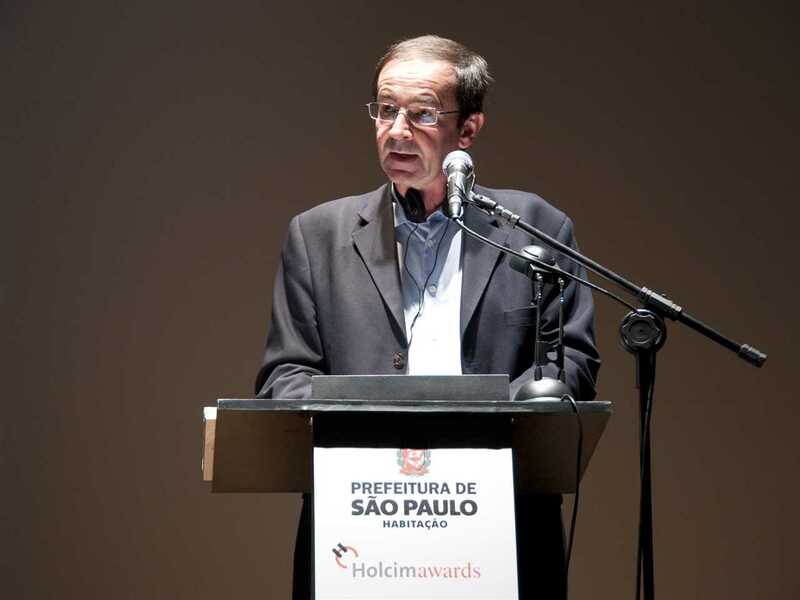 Photo: Diego Brito. Social infrastructure that improves marginalized settlements. 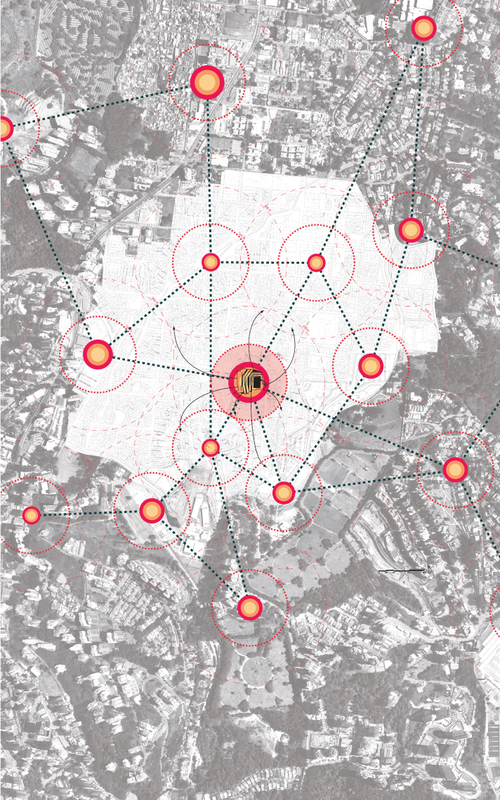 Transforming a void into a productive zone and dynamic public space. 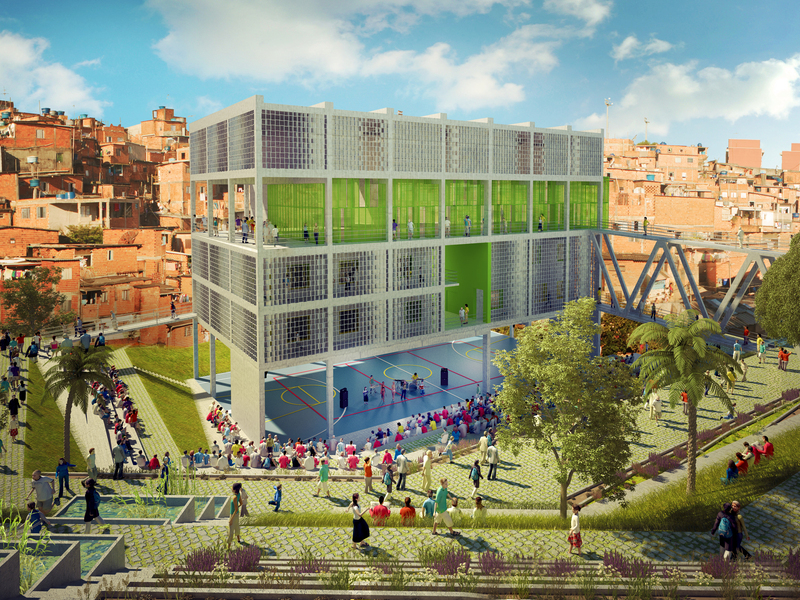 This project for a multifunctional public building, Grotão – Fábrica de Música (music factory), is located in Grotão in the heart of the Paraisópolis favela of São Paolo. 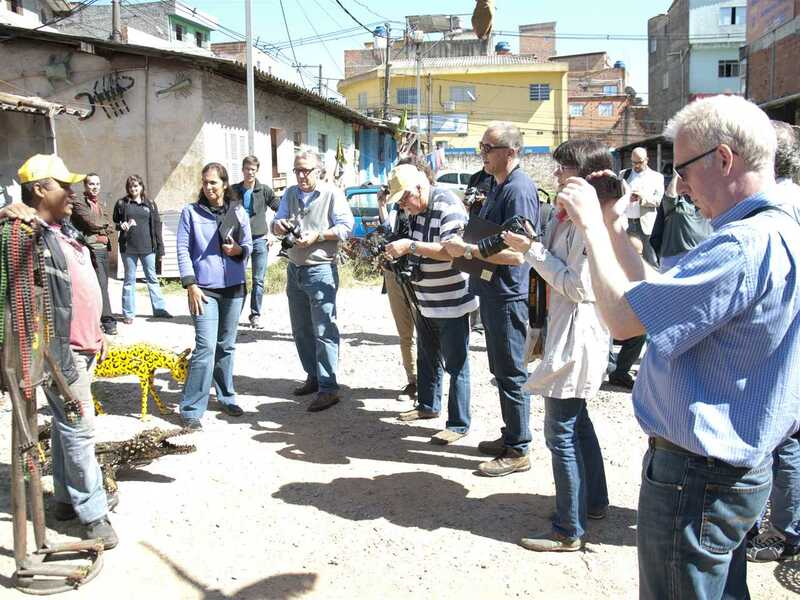 With more than 100,000 inhabitants, it is one of the largest informal communities worldwide. Like many favelas, and despite its unusually central location, the area is effectively separated from the formal city and its social and cultural infrastructure. 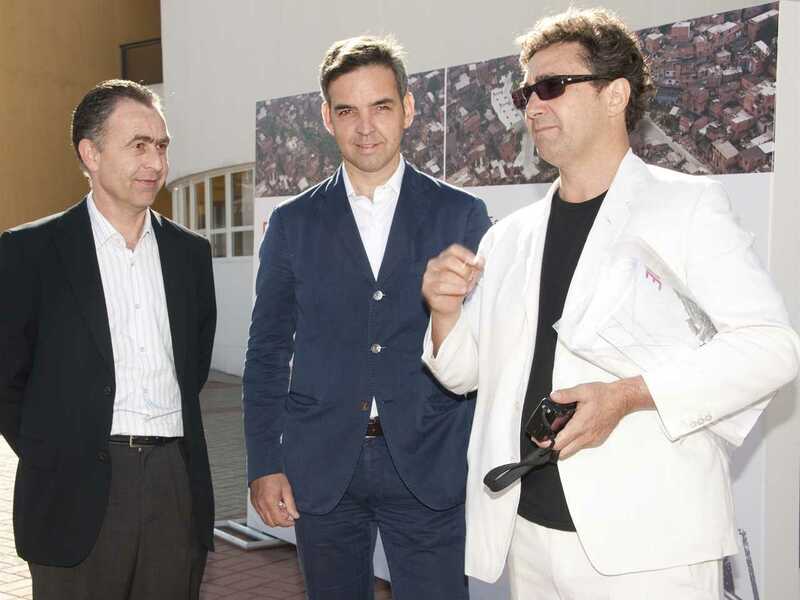 Science and technology journalists from Swiss newspapers, magazines, journals, radio, television and online media were introduced to the Urban remediation and civic infrastructure hub by Associate Partner Wagner Rebehy (center) from project architects Urban-Think Tank (U-TT) on behalf of Principal Architects Alfredo Brillembourg and Hubert Klumpner. 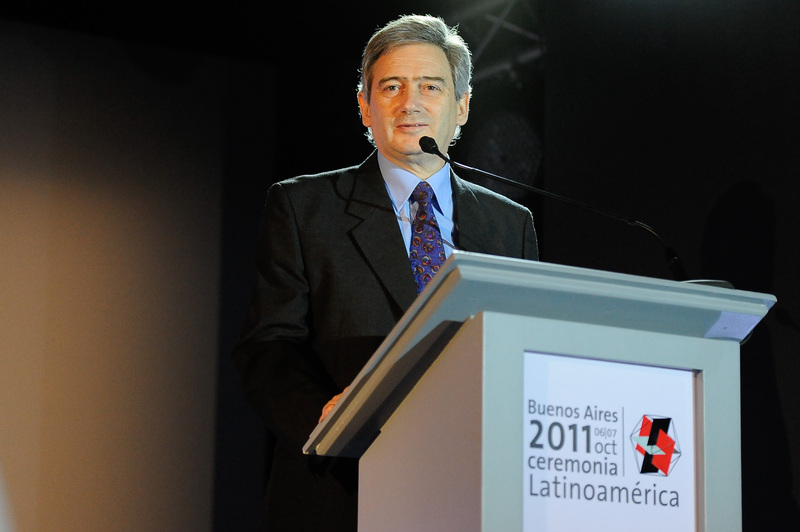 Photo: Diego Brito. 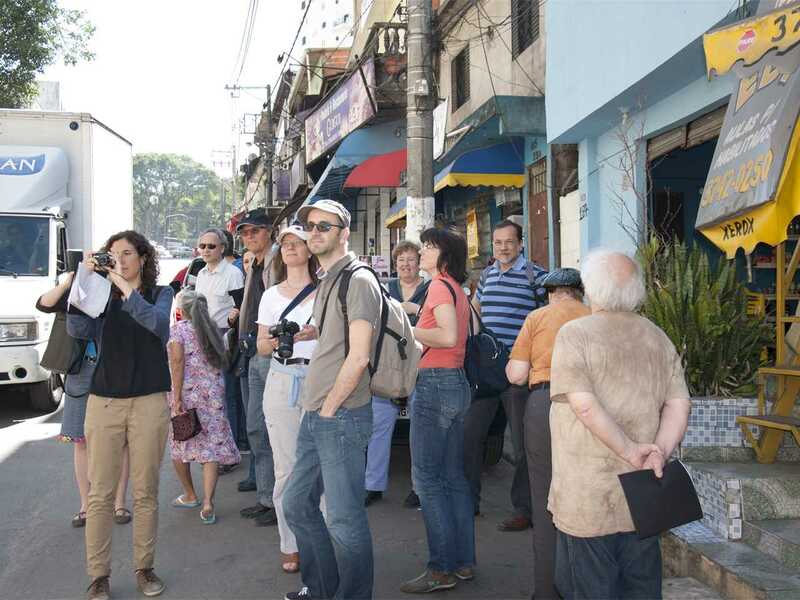 Members of the Swiss Association of Science Journalism visited the Paraisópolis favela in São Paulo where the project is to be constructed. 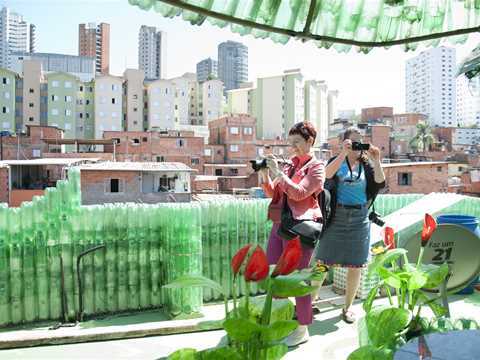 With more than 100,000 inhabitants, it is one of the largest informal communities worldwide. 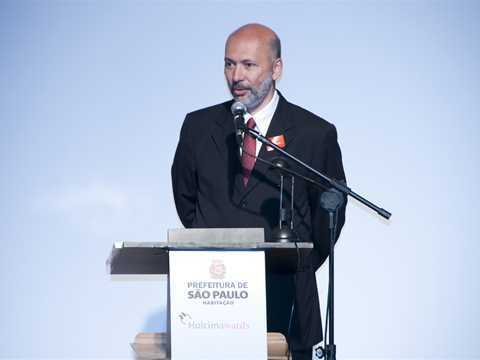 Brazil and Switzerland signed a bilateral agreement on cooperation in science and technology in 2009, which includes promoting exchanges between researchers and joint research projects. 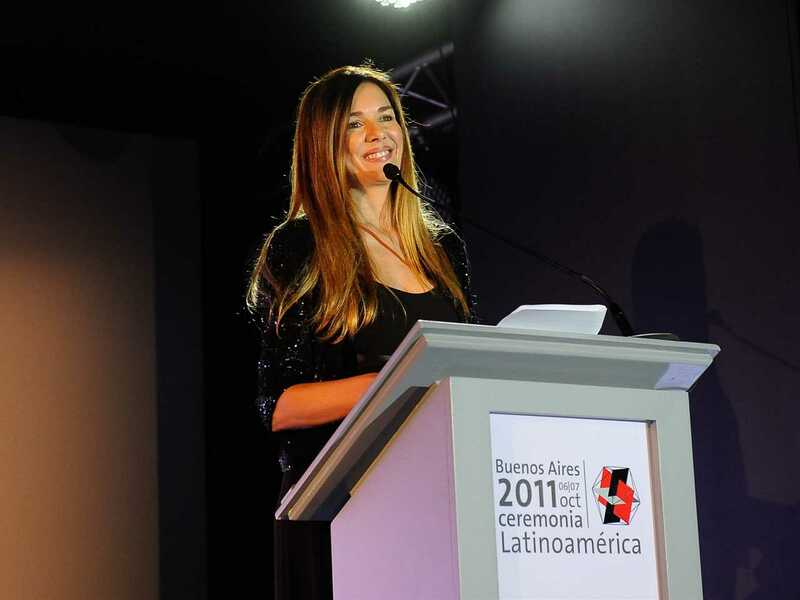 Photo: Diego Brito. An overview of the highly-regarded remediation project was presented in the office of the Paraisópolis residents and trade association by (l-r): Wagner Rebehy, Associate Partner, Urban-Think Tank (U-TT); Maria Tereza Diniz, Parasópolis Project Leader, Secretaria Municipal de Habitação (SEHAB); and Gilson Rodrigues, Leader of the Parasópolis Community. 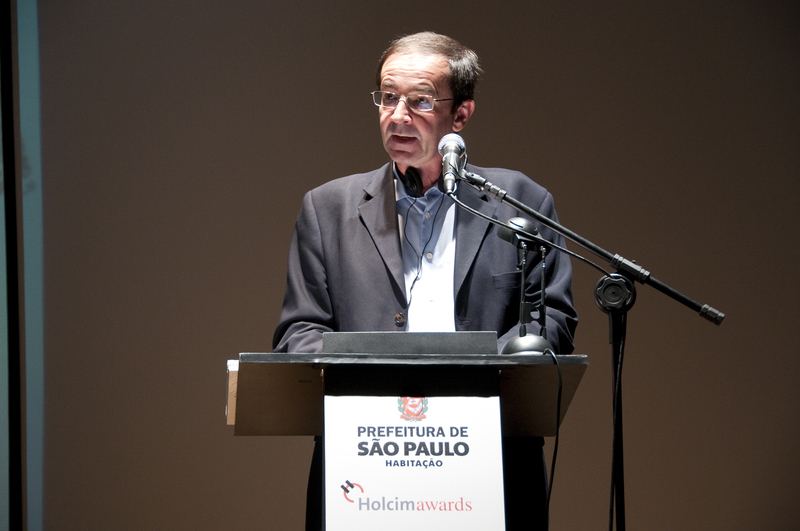 Photo: Diego Brito. The journalists saw a rehearsal by the Parasópolis Youth Ballet. The Group will benefit from the project where they will have spaces established and reserved for their activities on a permanent basis. 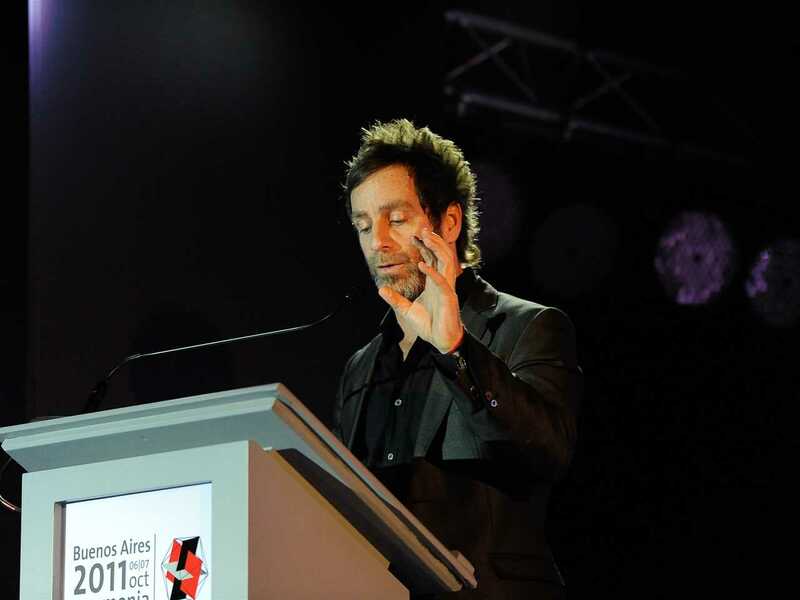 Photo: Diego Brito. 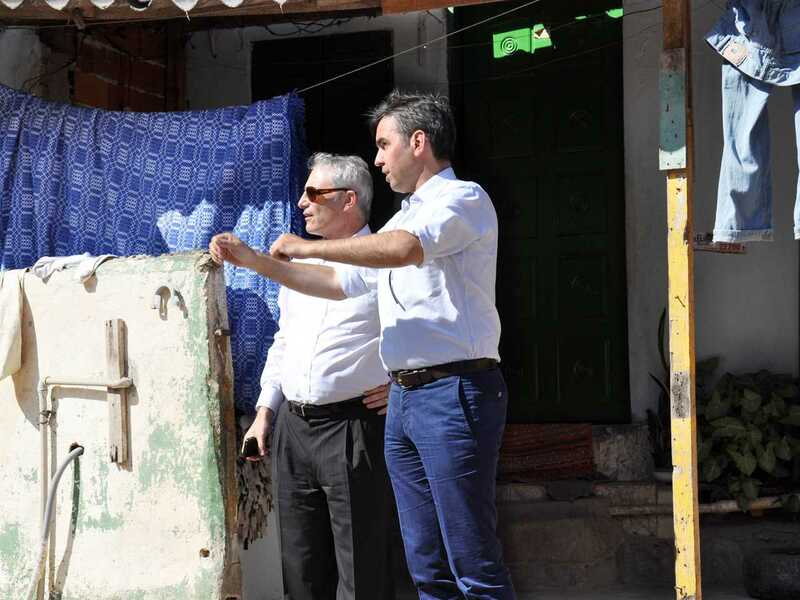 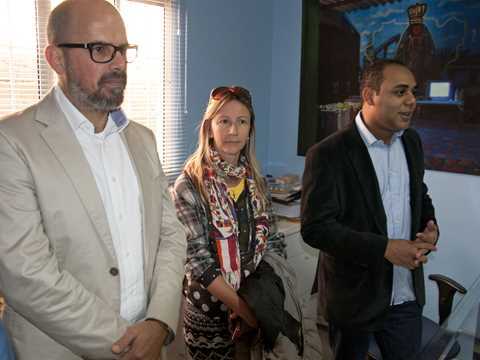 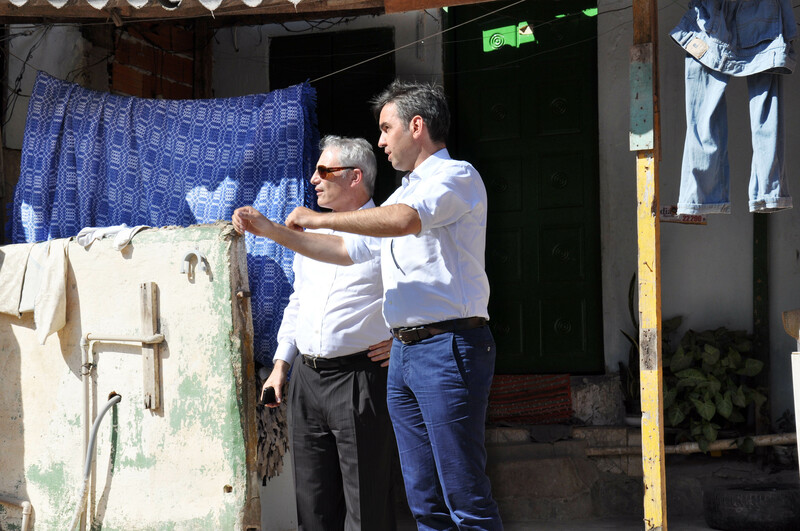 The delegation was shown the vibrant communities of the favela that would benefit in many ways from the project, and also the necessity of securing political support for the project to move towards implementation. 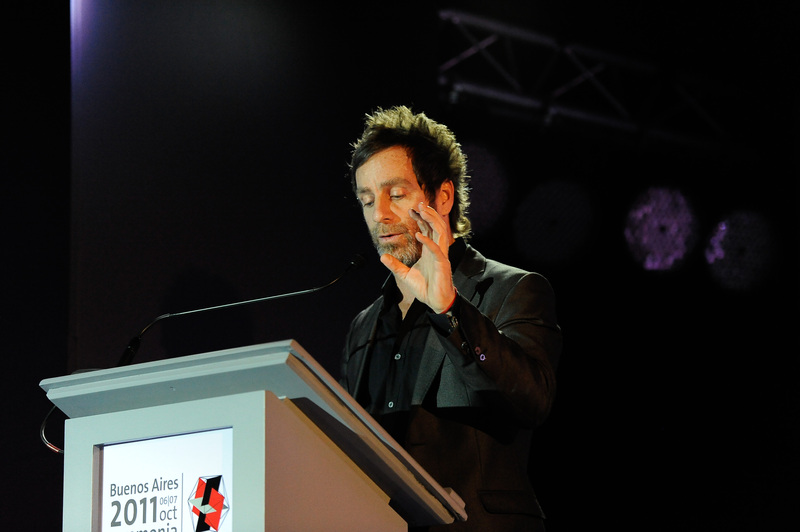 Photo: Diego Brito. 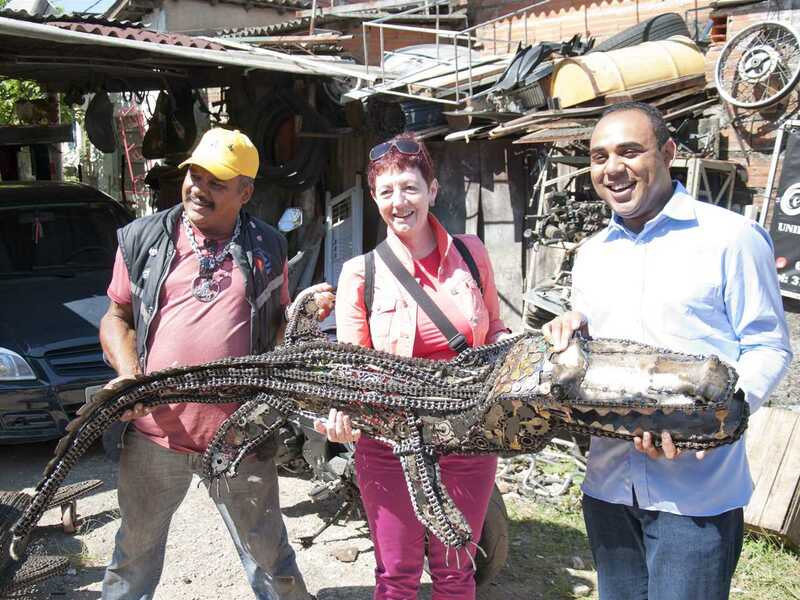 A walk through the community introduced the journalists to artists including Antônio Ednaldo da Silva (left), a motorcycle mechanic who creates his art from recycled elements of motorcycles. 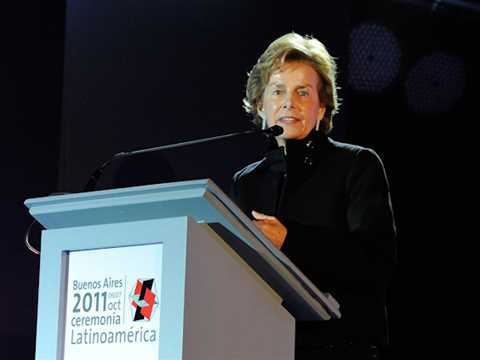 Photo: Diego Brito. 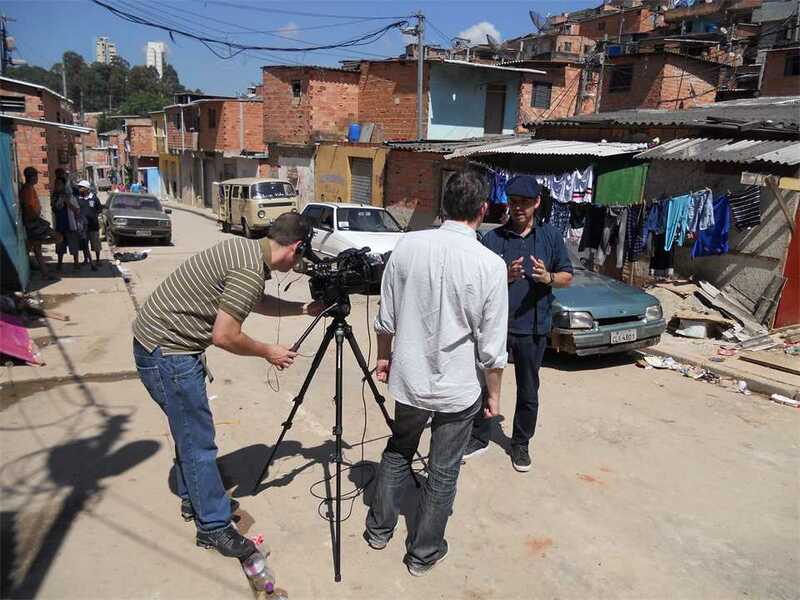 Antônio Ednaldo da Silva (left), a motorcycle mechanic who creates his art from recycled elements of motorcycles illustrates the latent cultural capital of the favela. 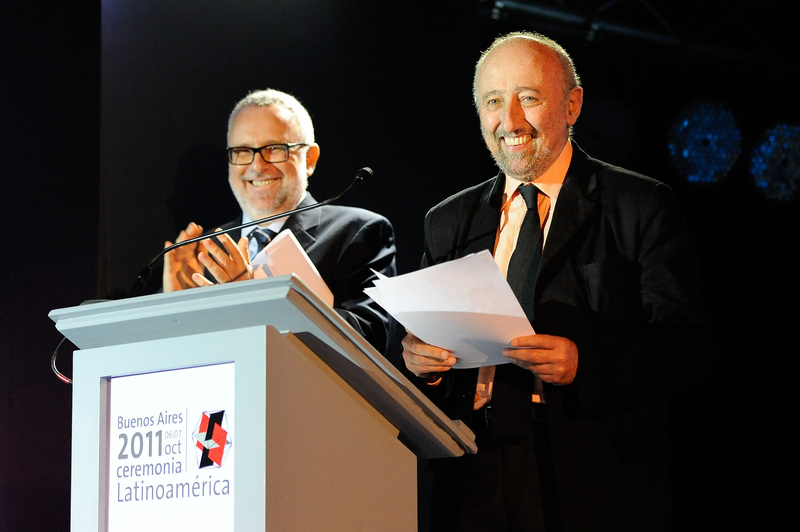 Photo: Diego Brito. 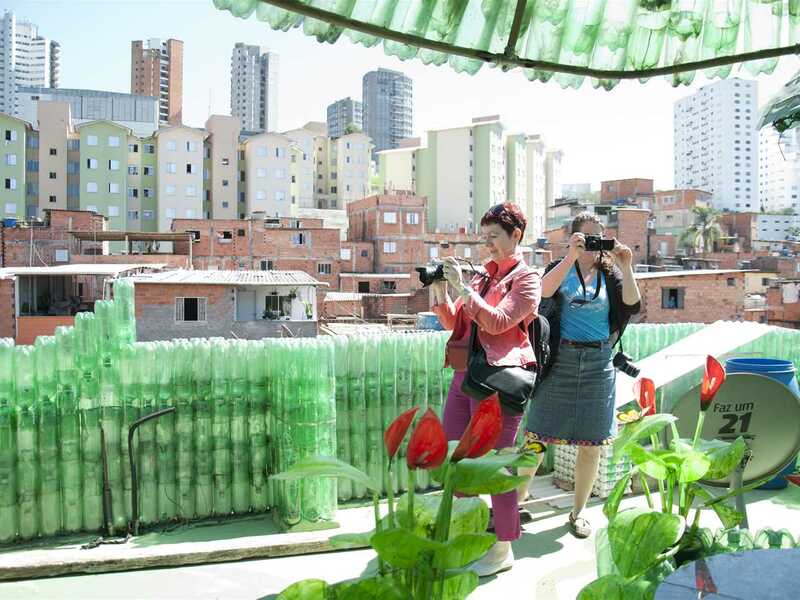 The home of Antenor Clodoaldo Alves Feitosa incorporates more than 26,000 plastic bottles as a structural component of the building. 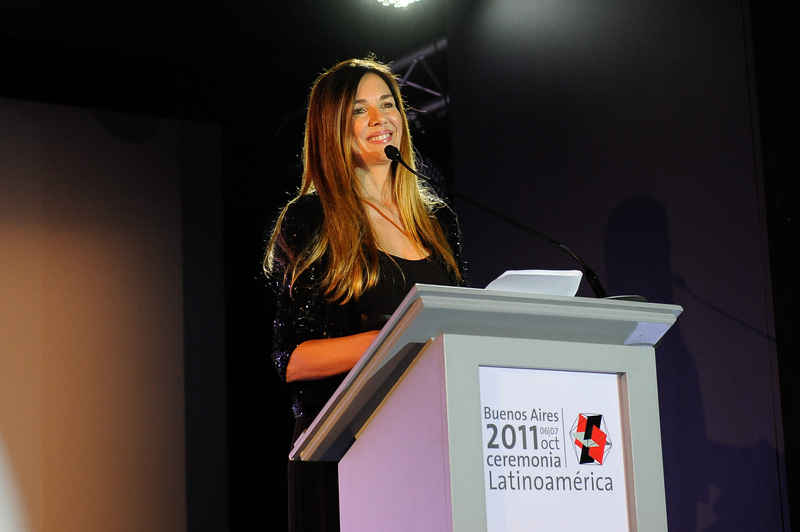 Photo: Diego Brito. 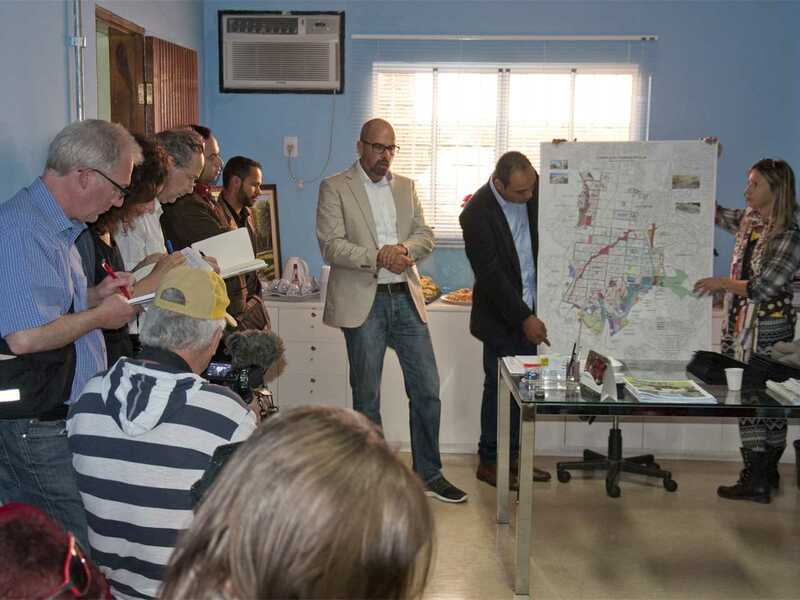 A site visit to the proposed Urban remediation and civic infrastructure hub by a delegation of journalists from Switzerland continues to build interest and support for the project. 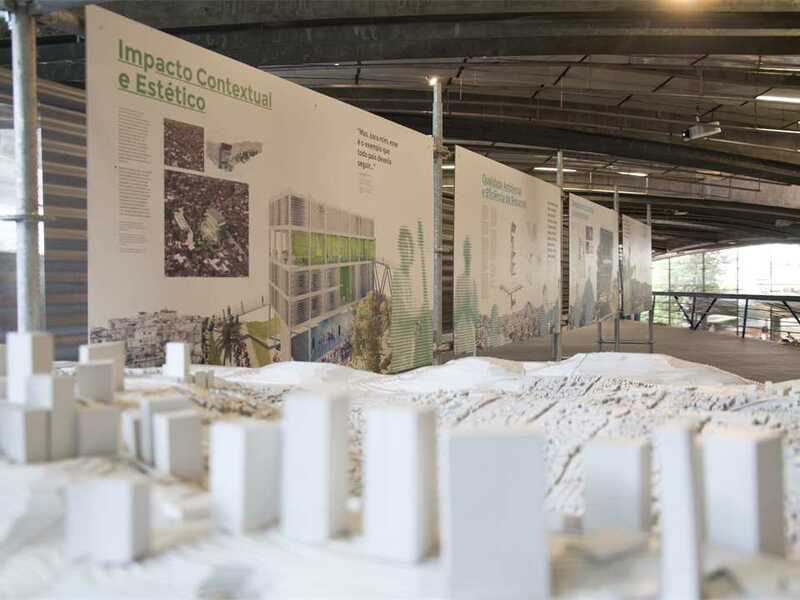 The enthusiastic community of the favela are aware of the array of benefits the project would provide - and also the necessity of securing political support for the project to move towards implementation. An overview of the highly-regarded remediation project was presented in the office of the Paraisópolis residents and trade association by: Gilson Rodrigues, Parasópolis Community Leader; Maria Tereza Diniz, Parasópolis Project Leader, Secretaria Municipal de Habitação (SEHAB); and Wagner Rebehy, Associate Partner, Urban-Think Tank (U-TT) in São Paulo, representing the project authors. 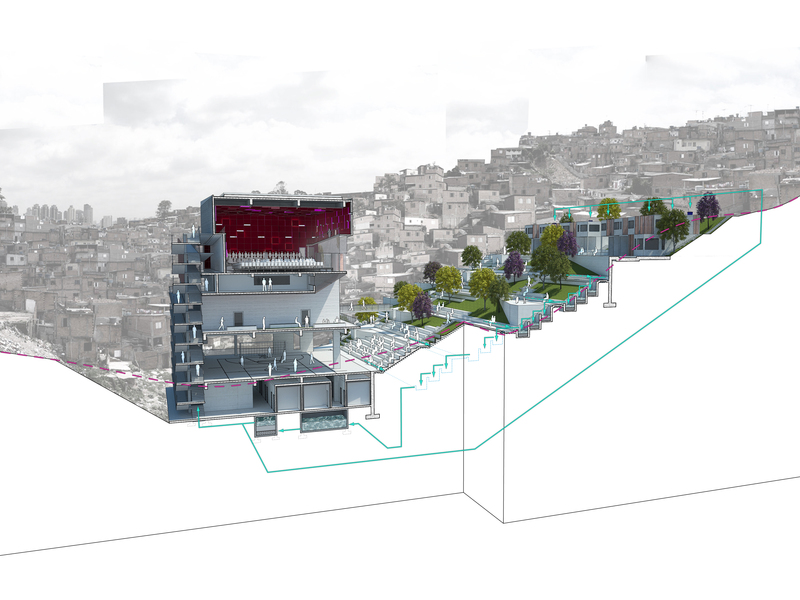 The design by U-TT’s Alfredo Brillembourg and Hubert Klumpner provides social and cultural infrastructure, as well as reducing the risk of erosion and mudslides. 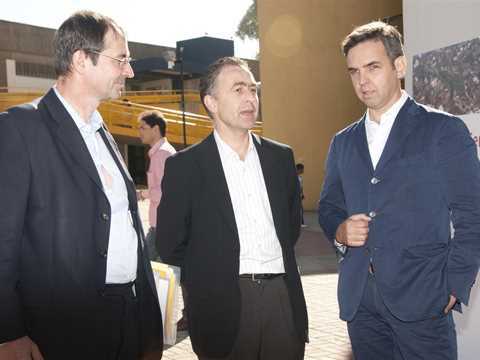 The visit was part of a tour arranged by the Swiss Association of Science Journalism to investigate Brazil’s dynamic development in science and technology, to further dialog between researchers and to evaluate potential scientific fields of collaboration. 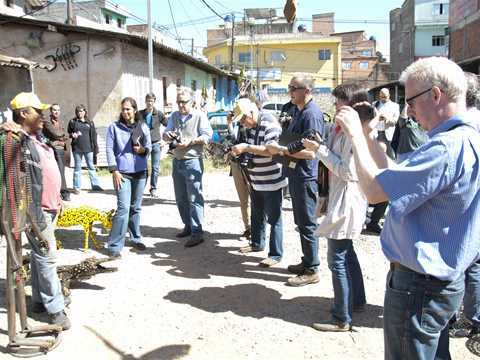 The group included scientific editors and journalists from leading newspapers, magazines, journals, radio, television and online media. 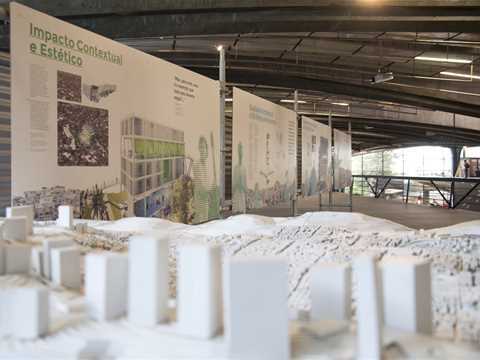 Following the presentations, the journalists also viewed the proposed site for the multifunctional public building, Grotão – Fábrica de Música in the heart of the Paraisópolis favela of São Paulo. 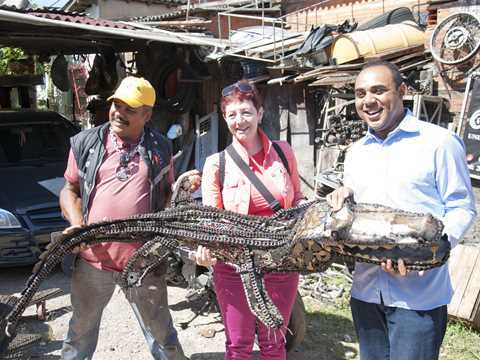 With more than 100,000 inhabitants, it is one of the largest informal communities worldwide. 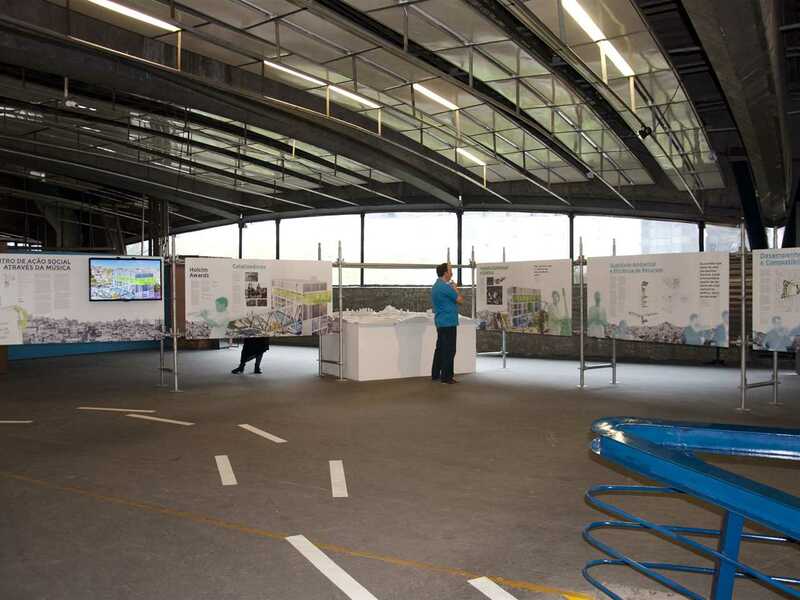 The Urban remediation and civic infrastructure hub takes up the key challenges of the site through geological, architectural and social elements that flourish by building intense community participation. 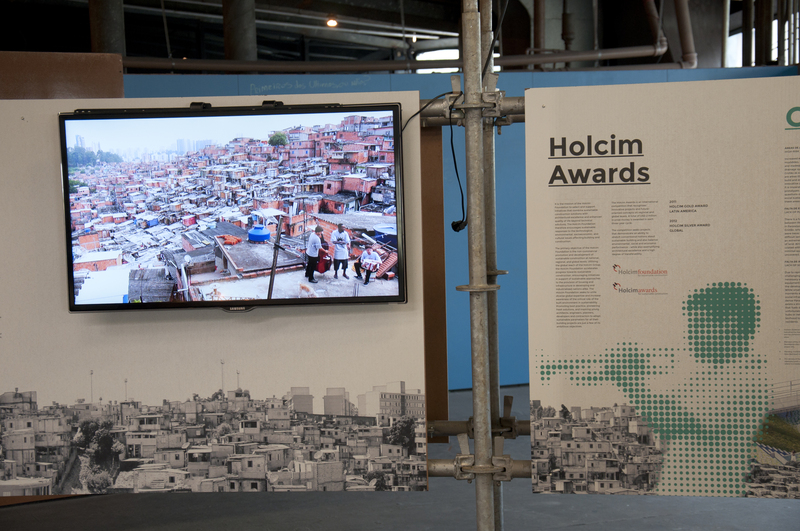 The Holcim Awards winner Grotão –Fábrica de Música by Urban-Think Tank (U-TT) has attracted a lot of attention on how lives can be improved in a mega city, especially for people living in informal settlements. 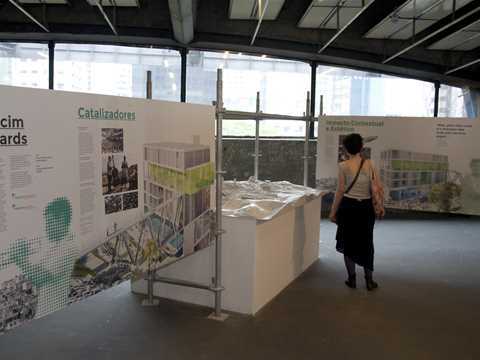 The project is featured at the X Bienal de Arquitetura de São Paulo exhibition dedicated to the topic “Making a City, Using a City” curated by Guilherme Wisnik, Ana Luiza Nobre, and Ligia Nobre. 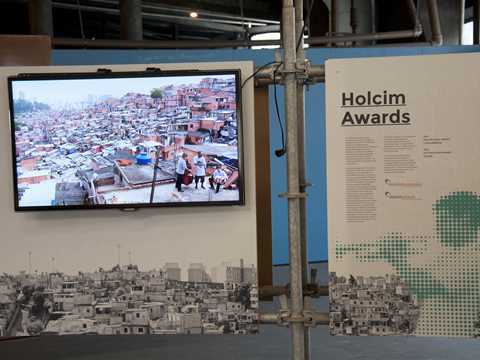 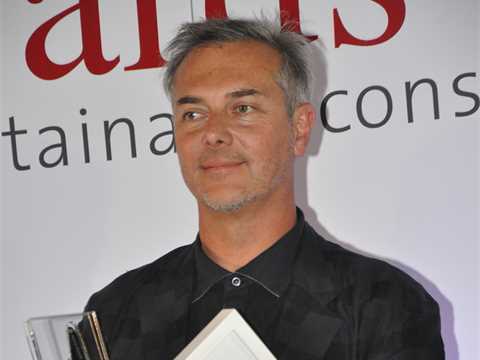 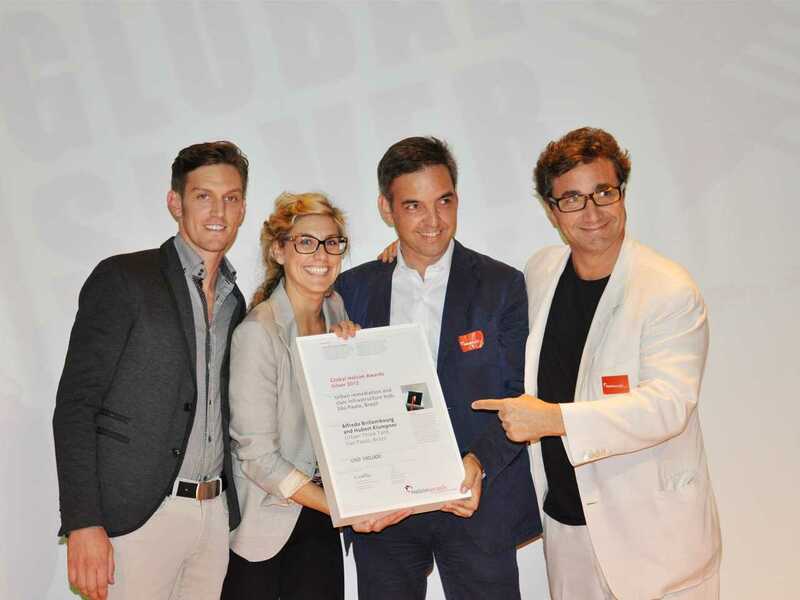 The project in the favela of Paraisopólis won the Global Holcim Awards Silver in 2012 for Alfredo Brillembourg (Venezuela) and Hubert Klumpner (Austria) who jointly Chair the Department of Architecture and Urban Design at the Swiss Federal Institute of Technology (ETH Zurich). 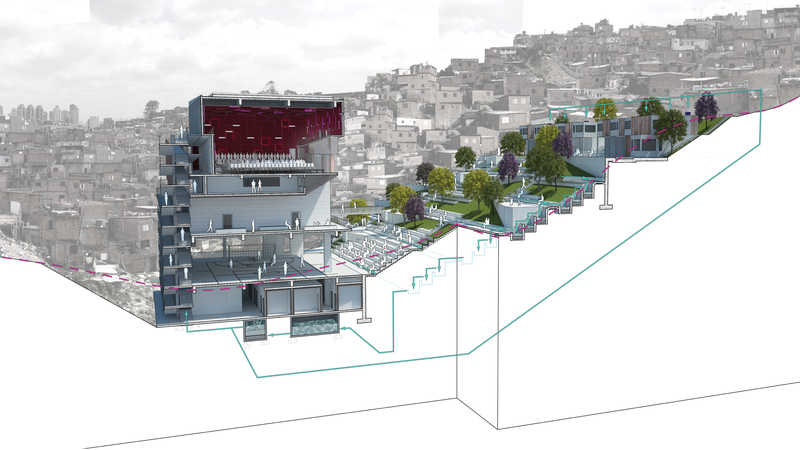 The presentation includes an impressive model of the project within the favela, showing how the new building serves many purposes including the creation of public space and avoiding mud slides on the steep hill. 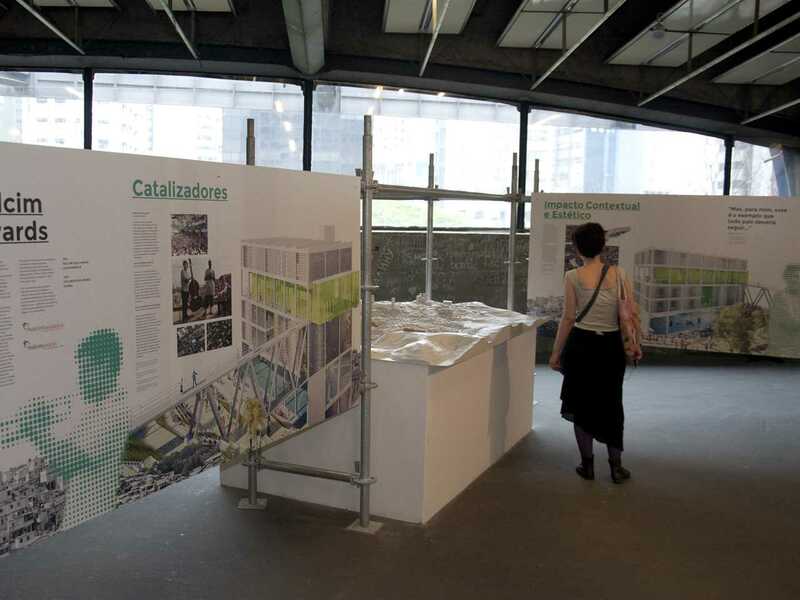 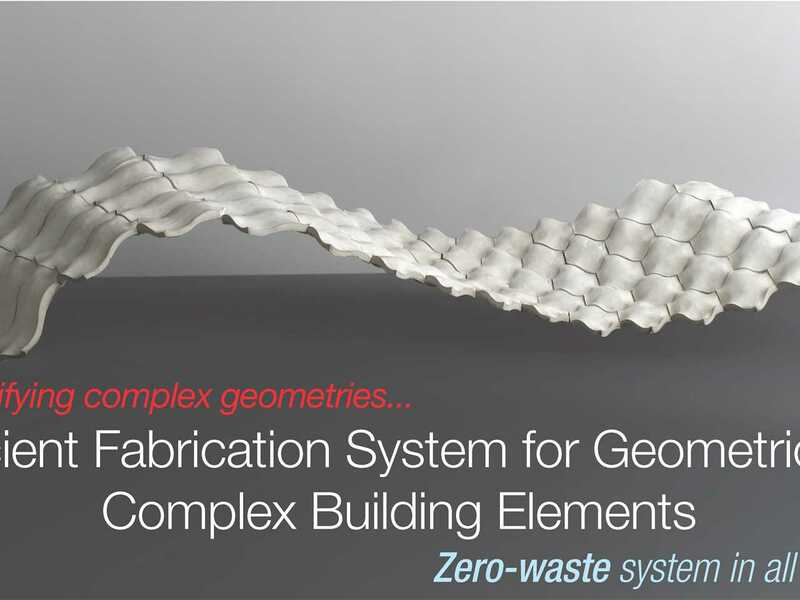 The model is complemented by a series of posters that illustrate the design concept. 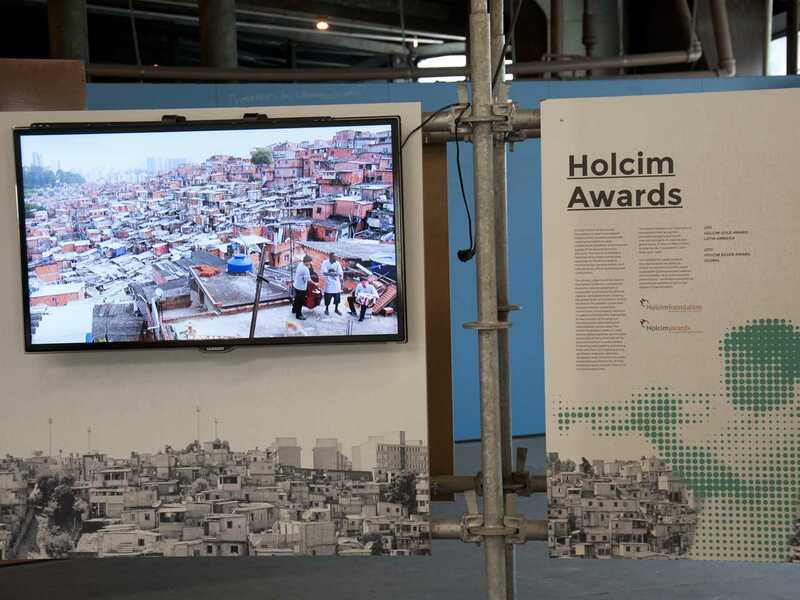 The X Bienal de Arquitetura de São Paulo exhibition is sponsored by Holcim Brazil and touches of the theme of sustainable construction and urban remediation at the heart of the Grotão – Fábrica de Música and the Holcim Awards competition. 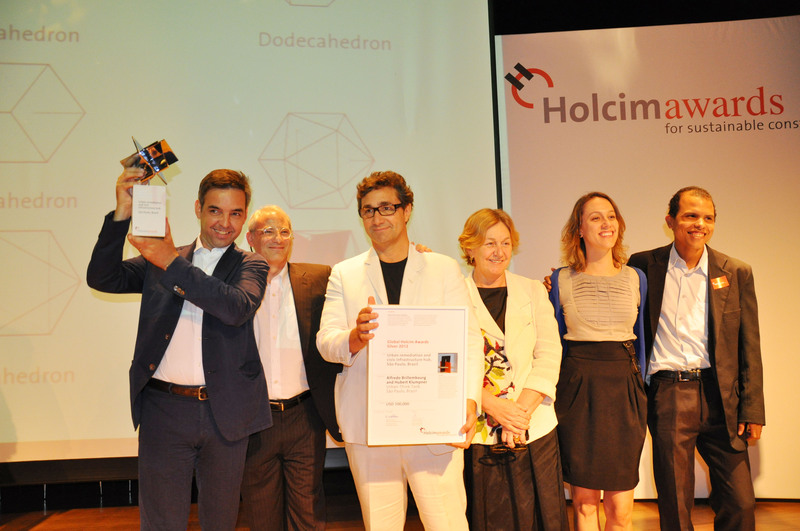 Three years earlier, the top Holcim Awards prize for Latin America was won by the Integral Urban Project (IUP) based in an informal area of Medellín, Colombia. 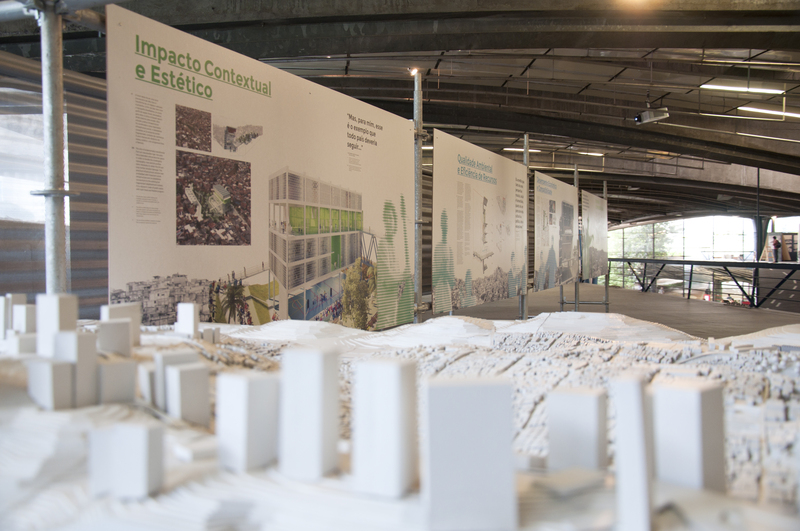 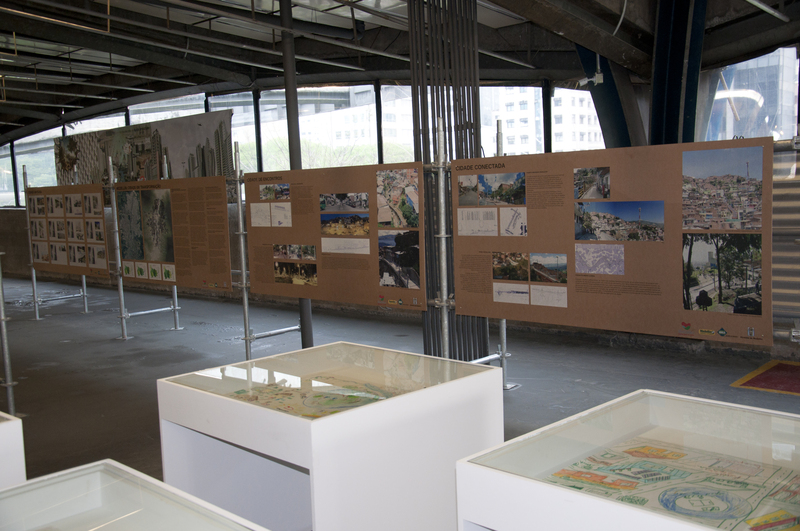 This project by Gustavo Restrepo Lalinde of Empresa de Desarrollo Urbano is displayed in the exhibition adjacent to the Paraisopólis project. 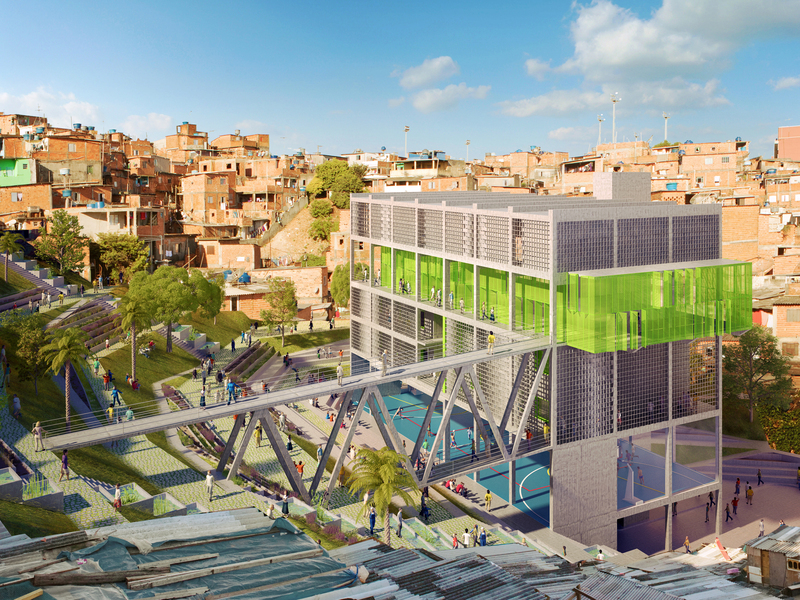 The Integral Urban Project (IUP) continues to be implemented at Comuna 13 in Medellín’s north-east. The recently-constructed system of escalators with public squares and balconies addresses serious problems regarding connectivity, security and coexistence. 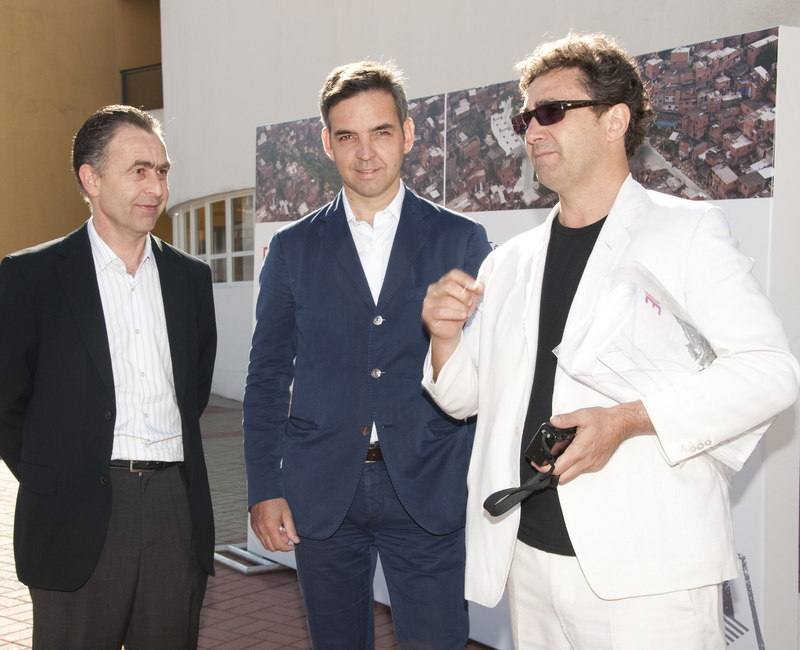 In addition, more than ten public buildings have been completed which provide infrastructure and important spaces for meeting and building social cohesion. 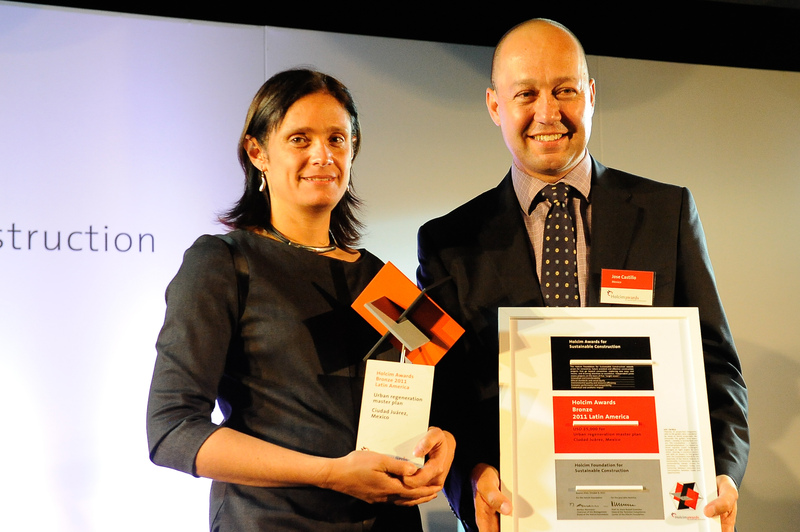 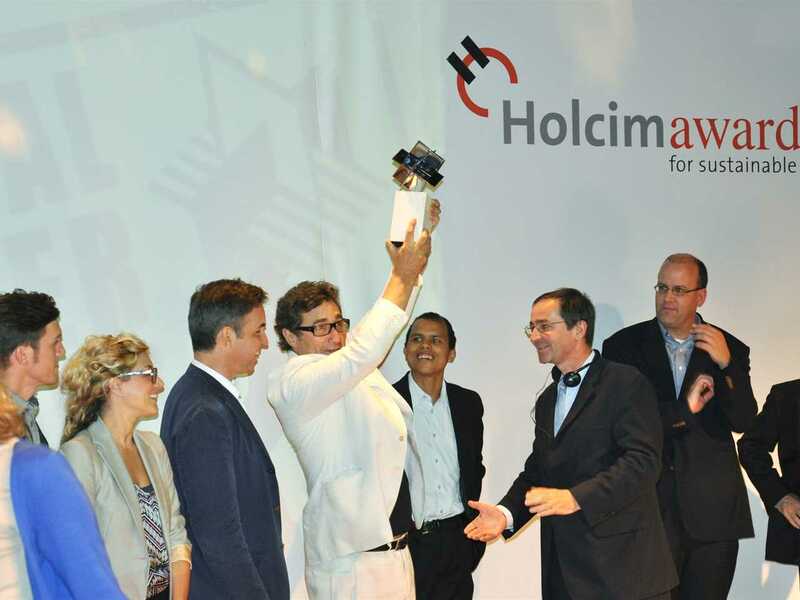 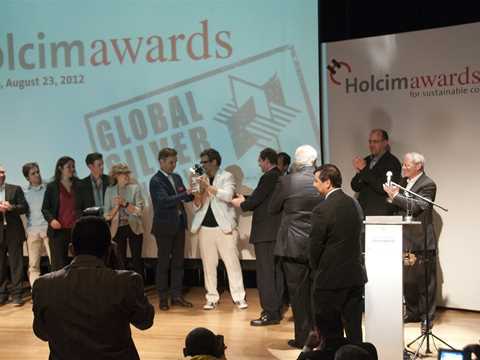 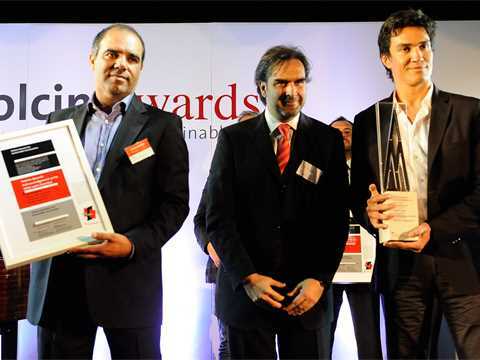 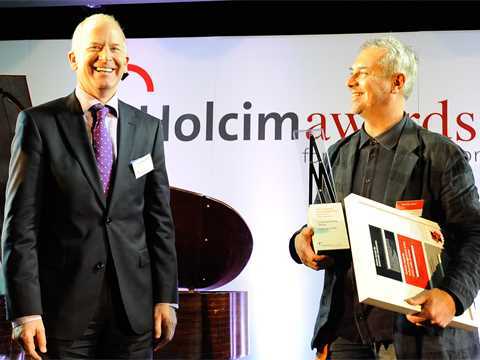 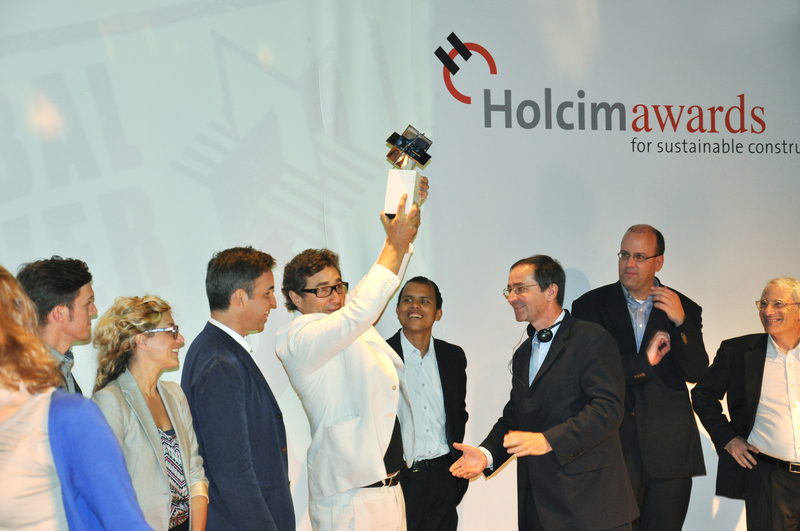 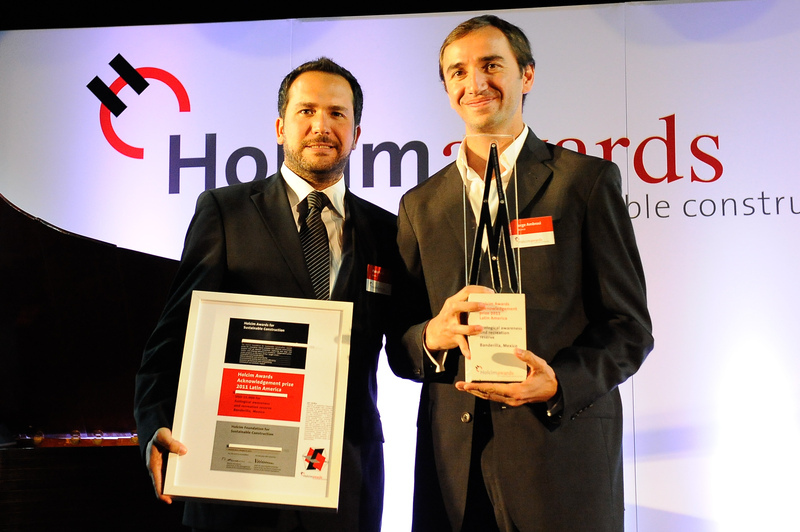 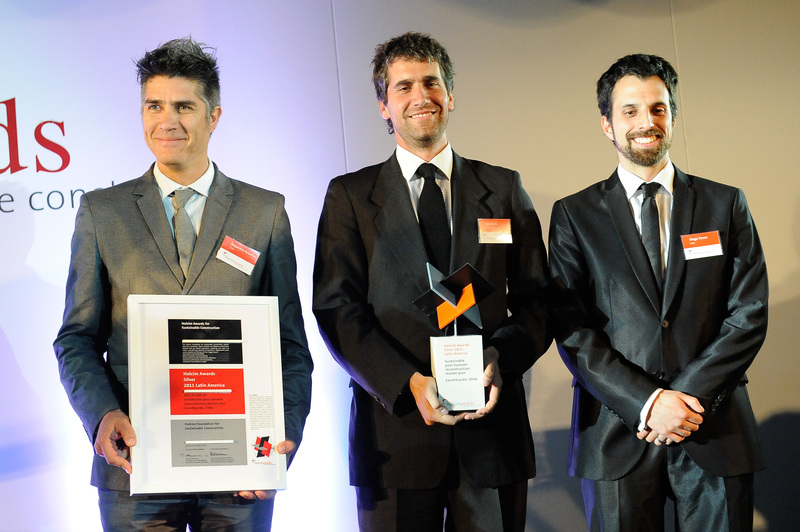 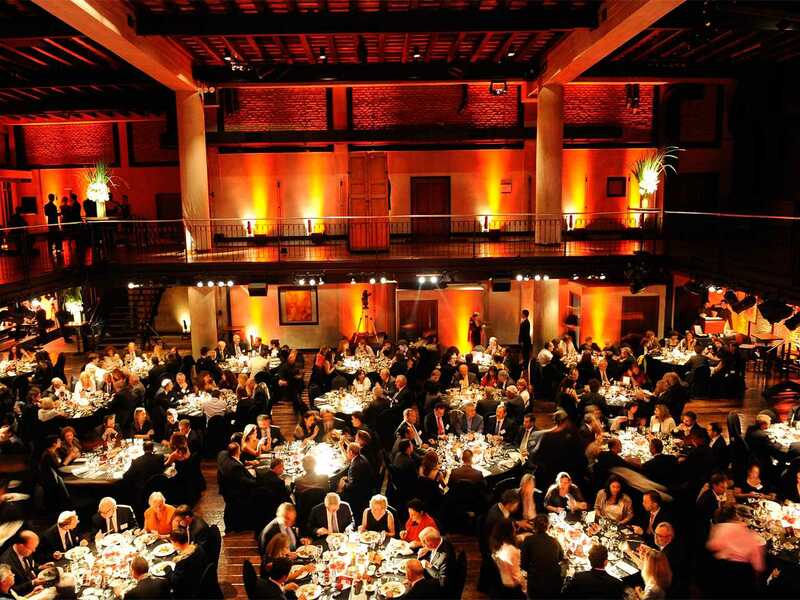 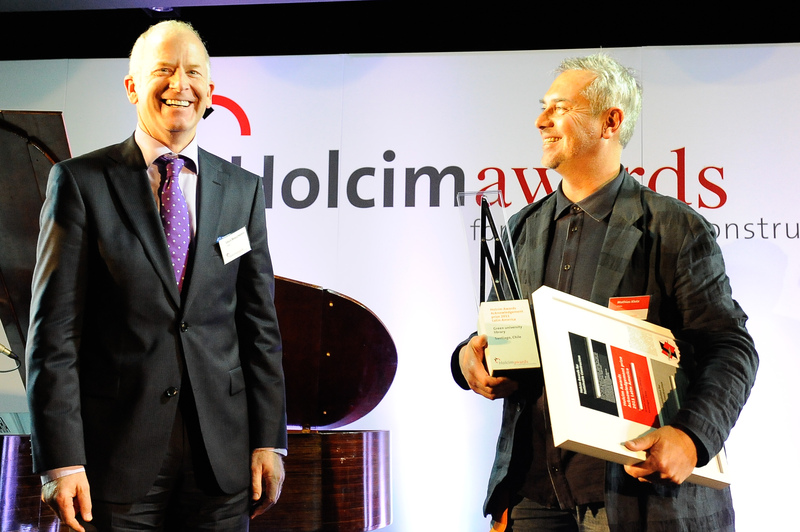 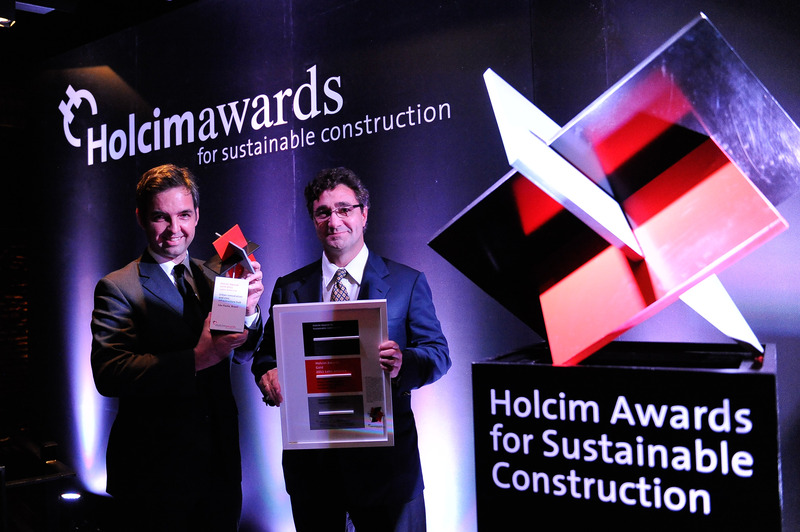 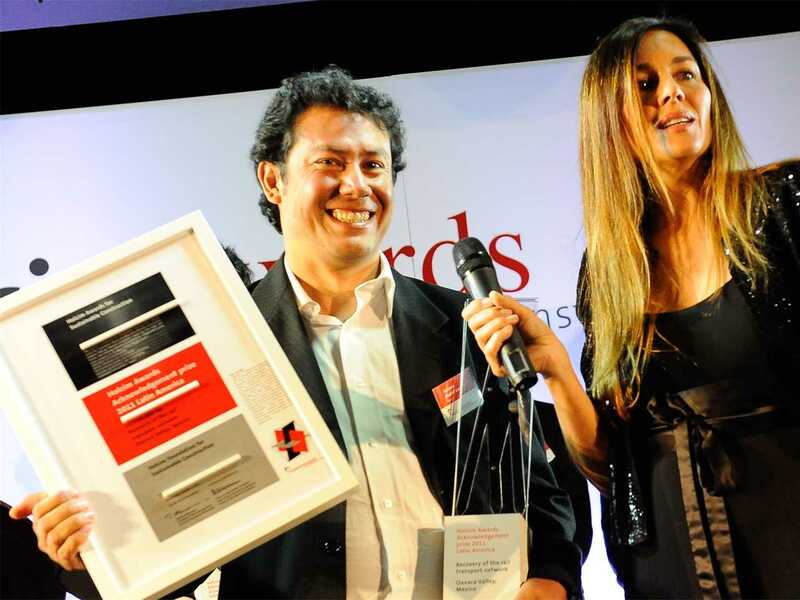 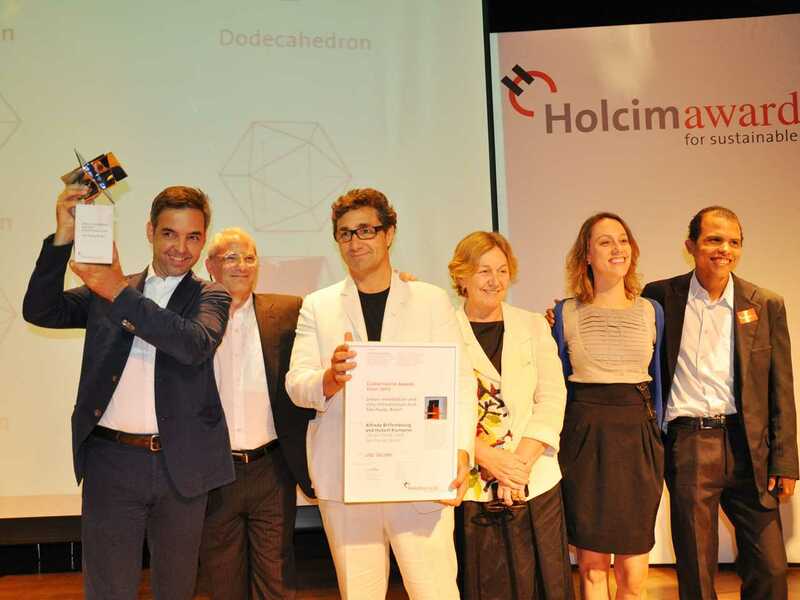 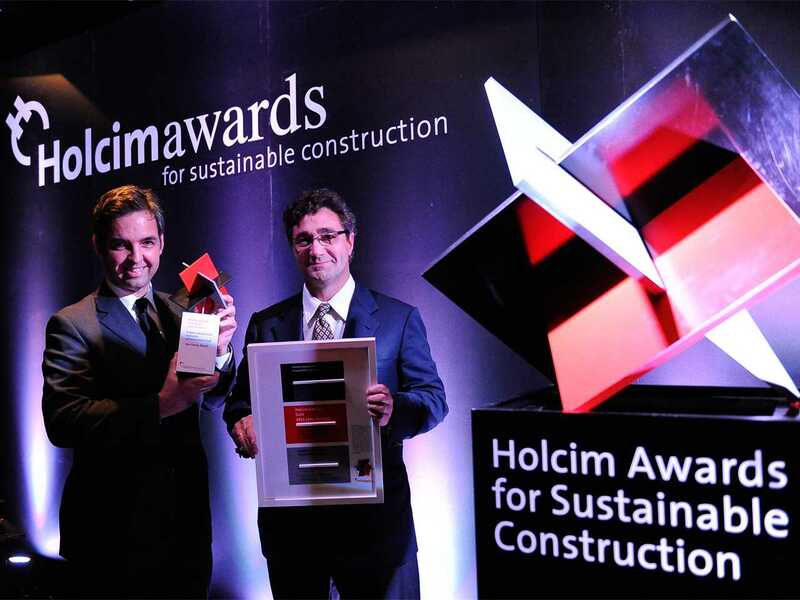 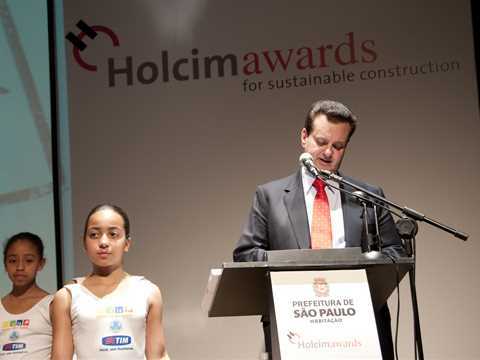 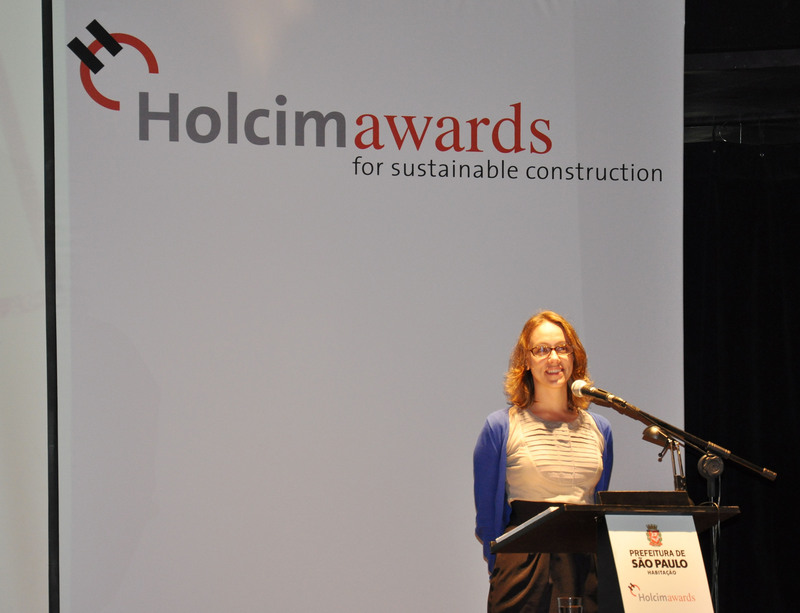 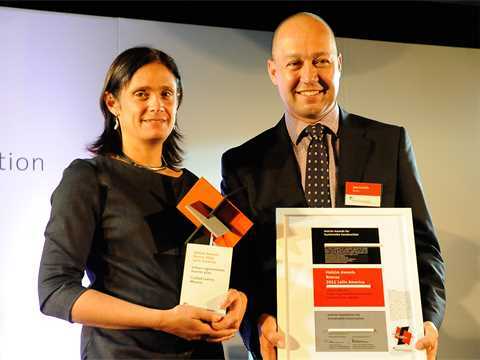 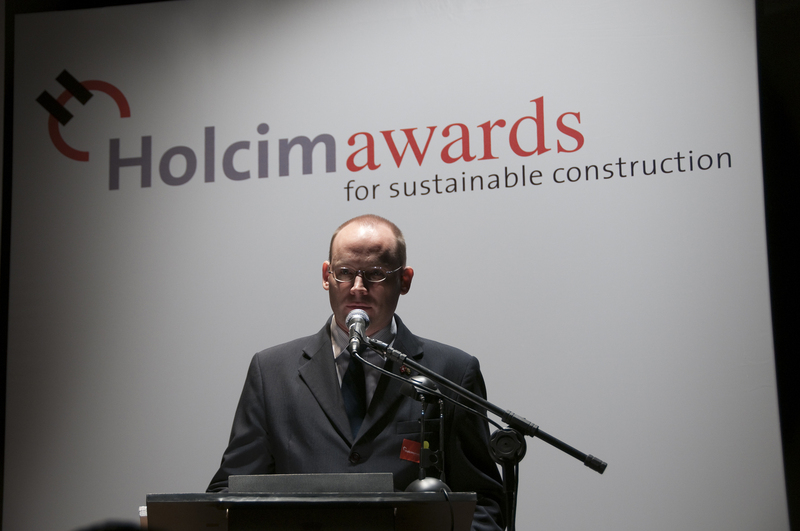 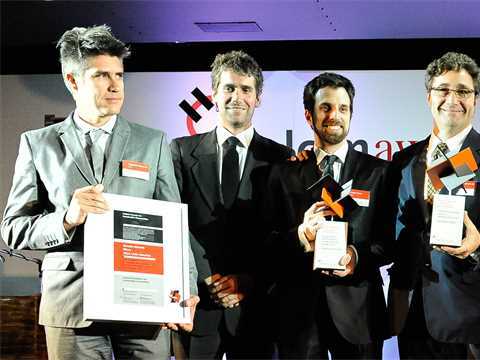 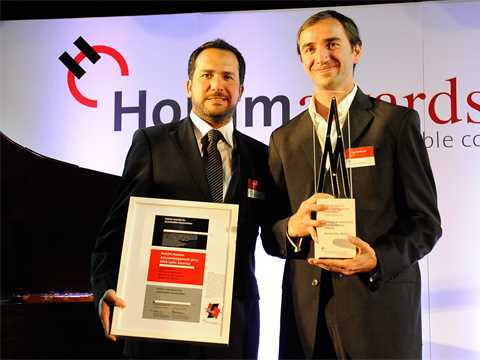 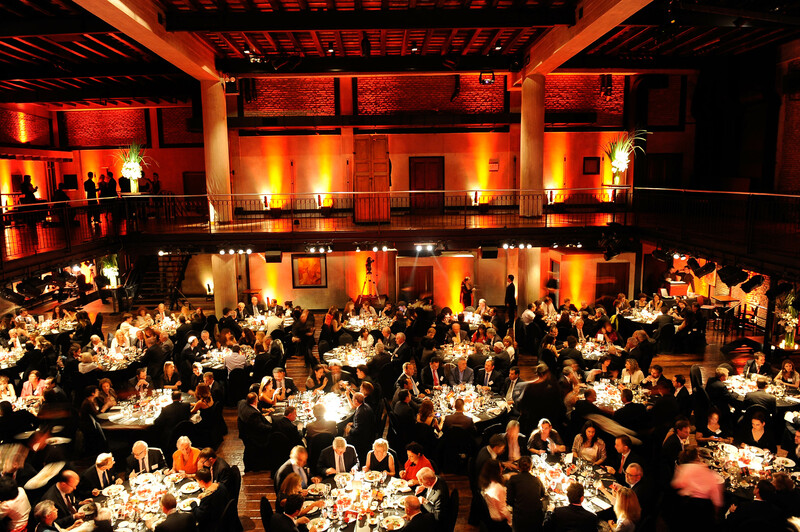 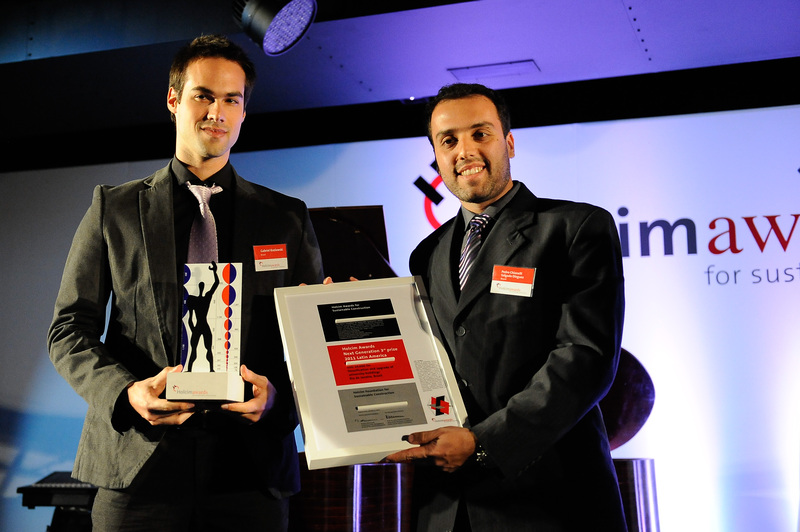 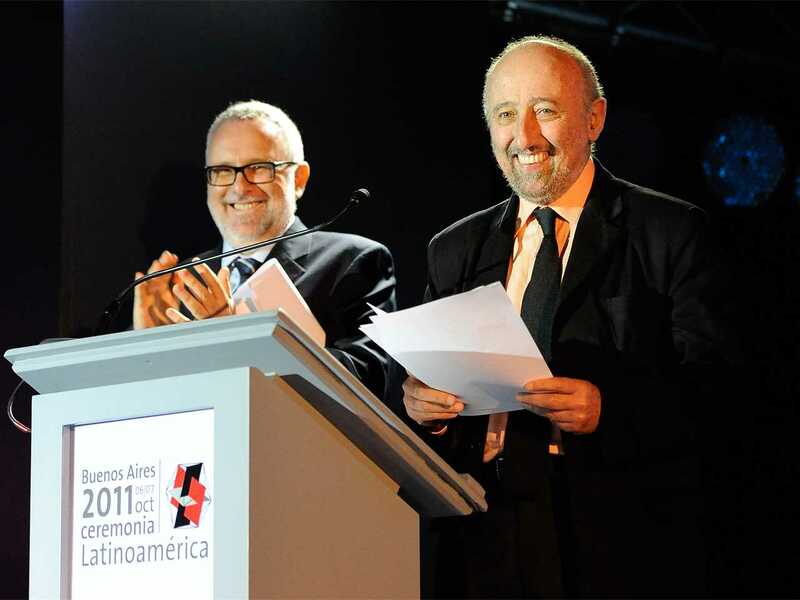 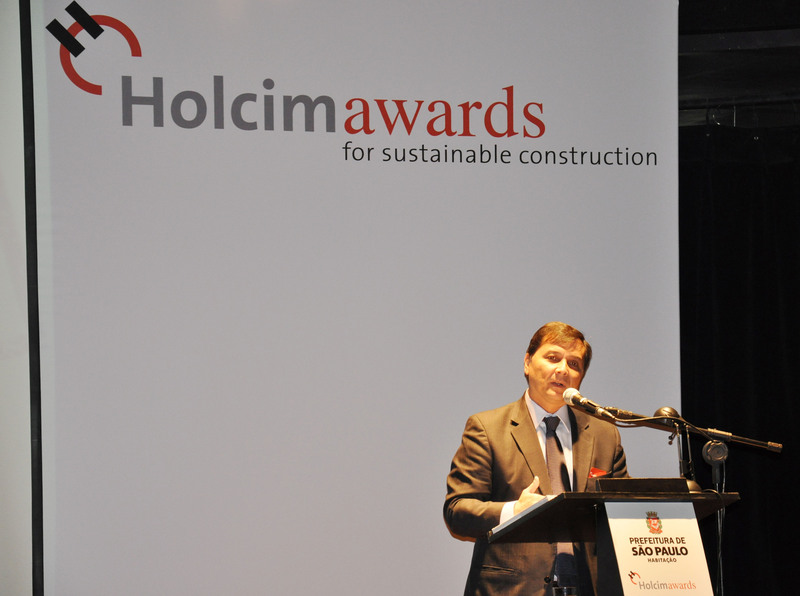 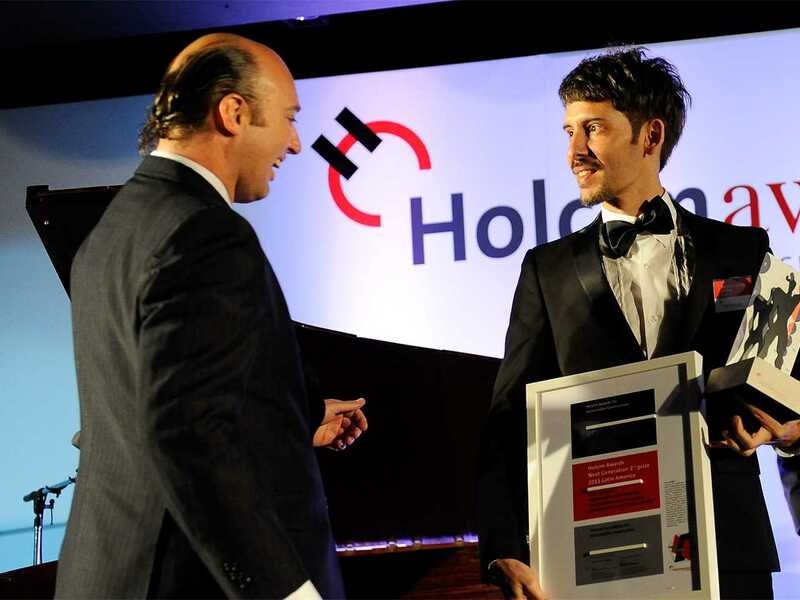 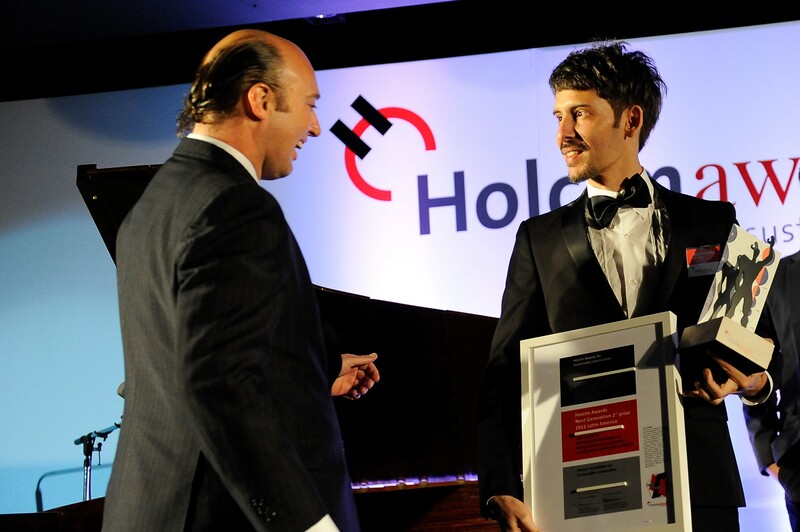 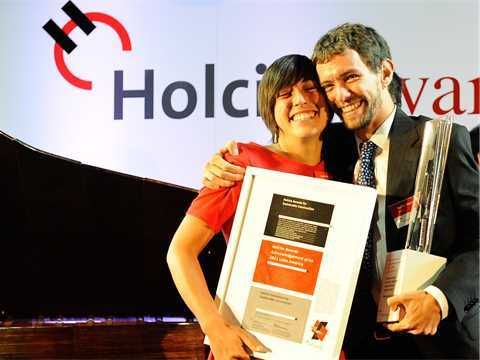 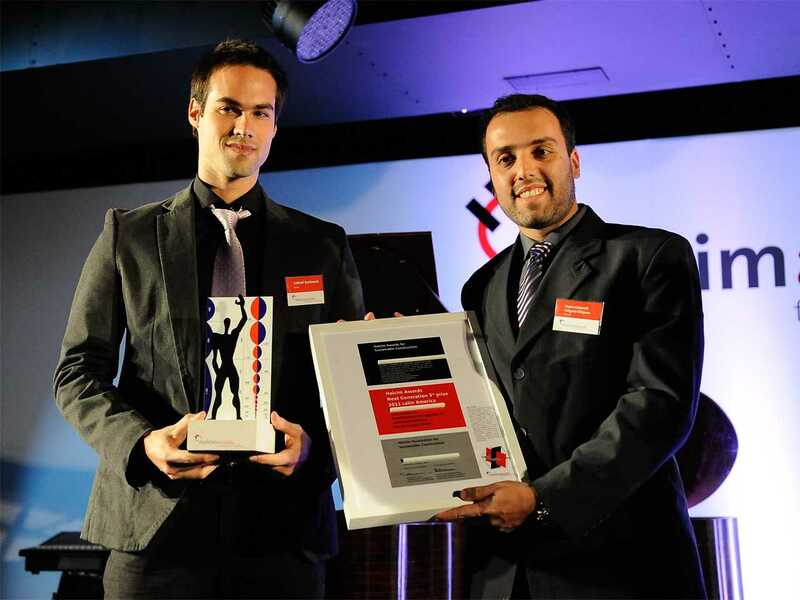 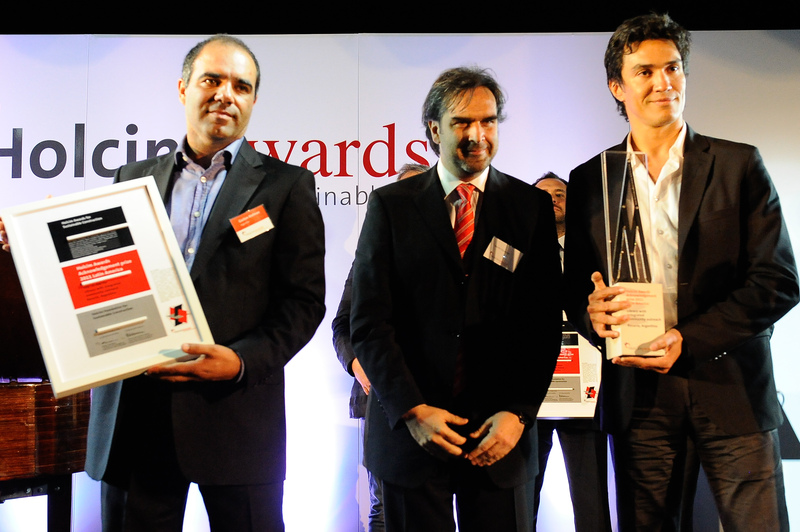 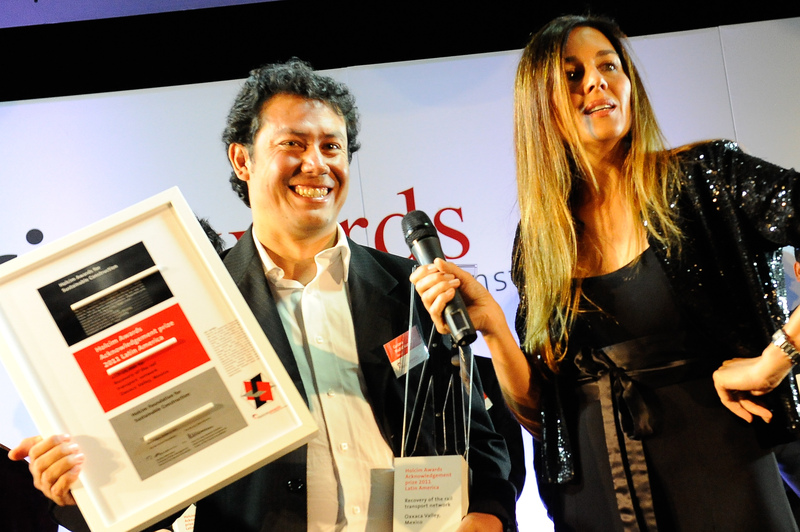 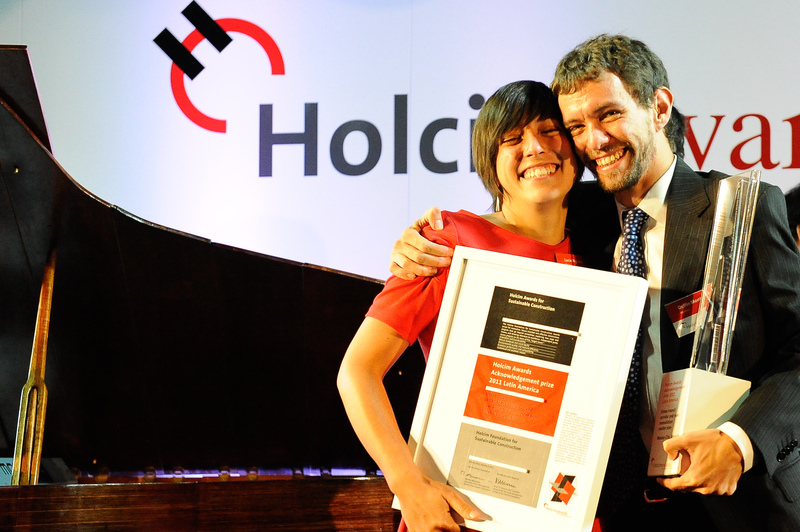 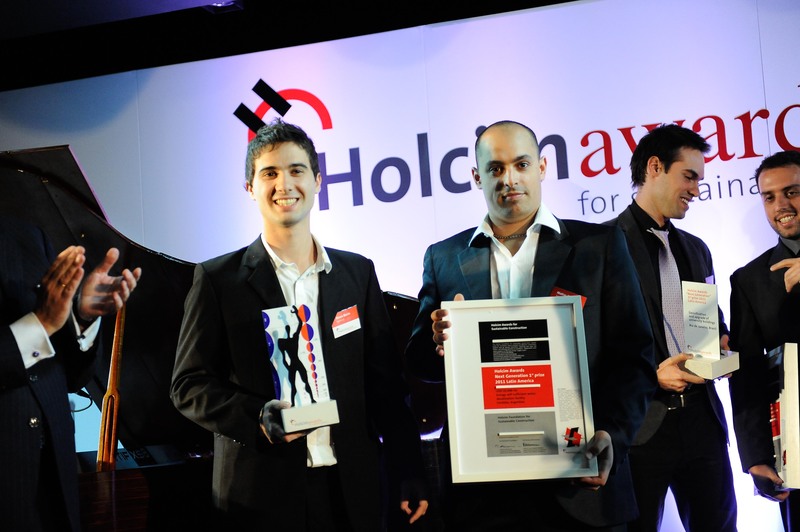 The next Holcim Awards winners for Latin America will gather in Medellín in October 2014 where the 4th International Holcim Awards will be announced. The competition is currently open for projects in architecture, building and civil engineering, landscape and urban design, materials, products and construction technologies that contribute to the five “target issues” for sustainable construction. 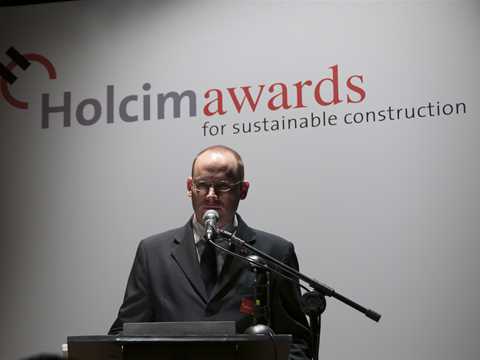 Registration is open until March 24, 2014 at 14:00hrs GMT. 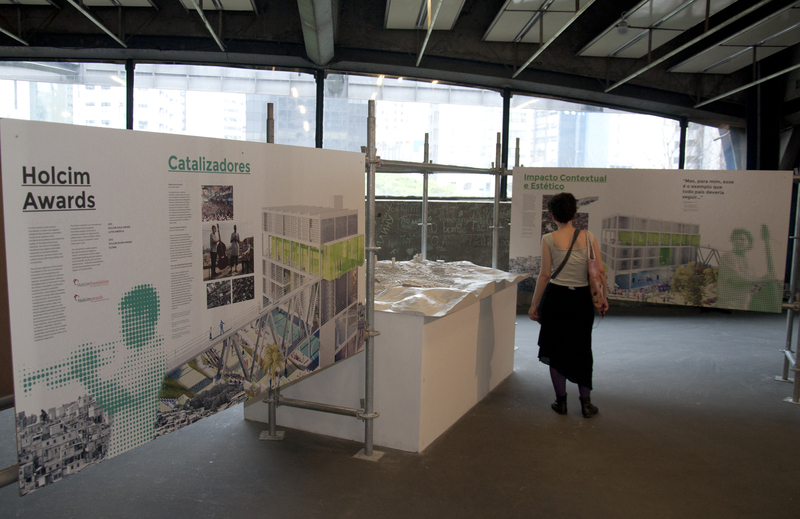 X Bienal de Arquitetura de São Paulo : Cidade, Modos de Fazer, Modos de Usa is open until November 24, 2013 at Centro Cultural de São Paulo, R. Vergueiro, 1000 - Paraíso, São Paulo, Brazil. 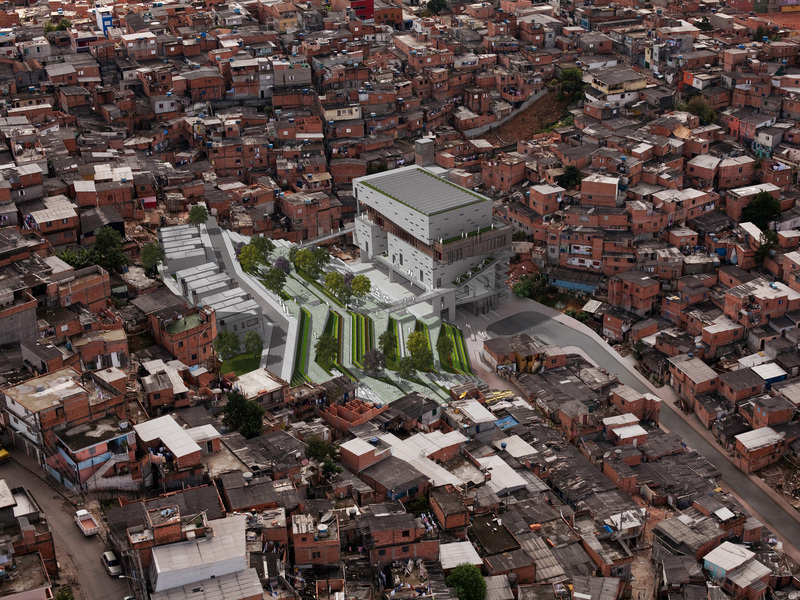 The jury was impressed by this proposal for a multifunctional public building in Paraisópolis, one of São Paulo’s largest favelas, because of its macro- and micro-scale approach to sustainability. 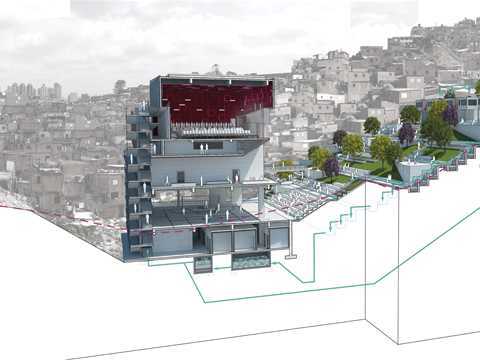 Located in the heart of the favela, the Grotão – Fábrica de Música (music factory) creates vertical density within the low-rise sprawl of the neighborhood’s informal housing and thus additional space and activity programs available to all residents. 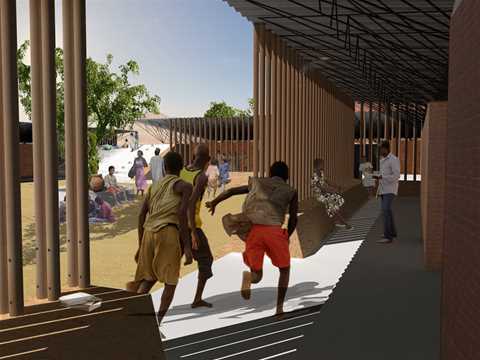 To address the lack of social and cultural infrastructure in the area, the building provides a music school, sports facilities, and transport infrastructure. 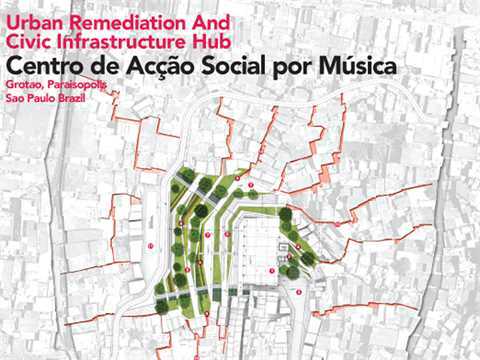 Public spaces for social interaction are located around, under, and within Grotão – Fábrica de Música. 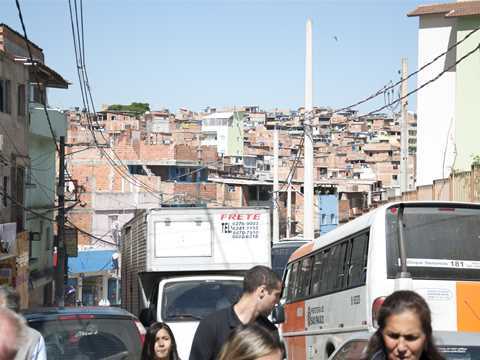 Despite its central location, the marginalized area of Grotão is completely separated from the formal city. 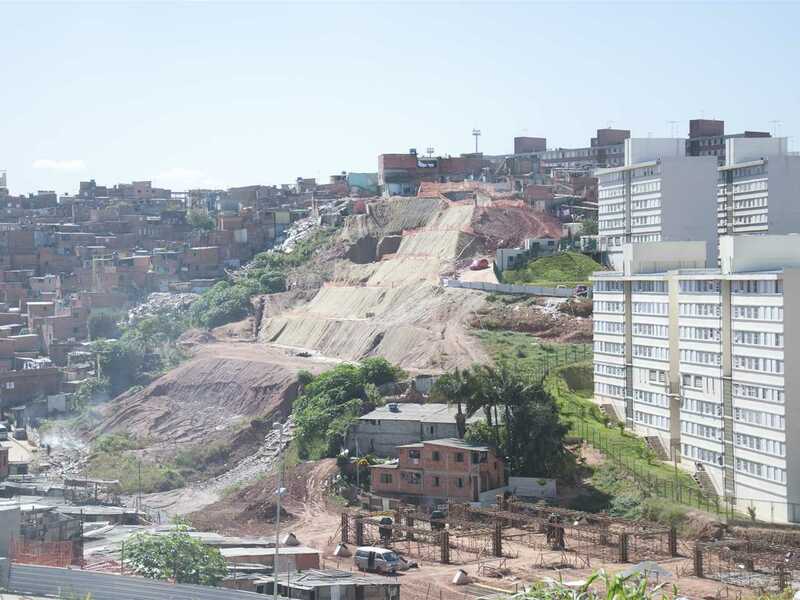 Within this isolated zone, increased erosion and dangerous mudslides have designated the site as one of the high-risk zones of São Paulo. The project structure retains and stabilizes the area’s challenging topography, creating a green island in a terraced public space and room for urban agriculture. The architects have proposed a variety of low-tech features. A water management system will be introduced to collect rainwater and reuse grey-water. 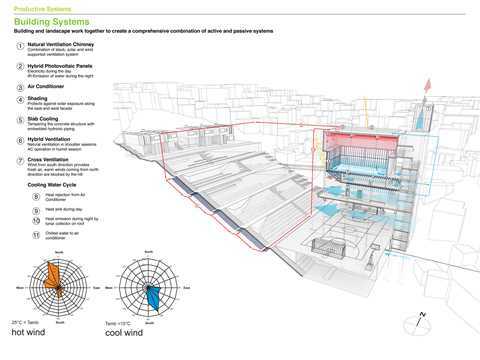 Both the building and its amphitheater will adopt an integrated system of active and passive ventilation, cooling, and air conditioning. Building and landscape will thus combine into one system to effectively handle the area’s varying climatic conditions. The project is clear and powerful: it expands sustainability beyond the management of natural resources and takes it into the realm of social sustainability. 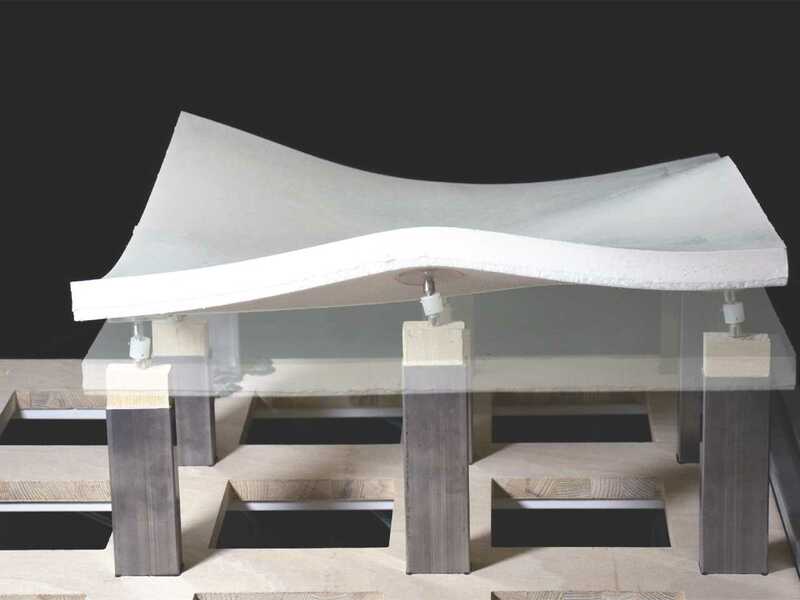 The design process is participatory in both its initial phase and in the end use of the space. By applying locally-known construction materials and technologies, the project will create work opportunities for small-scale construction businesses in and around the neighborhood. 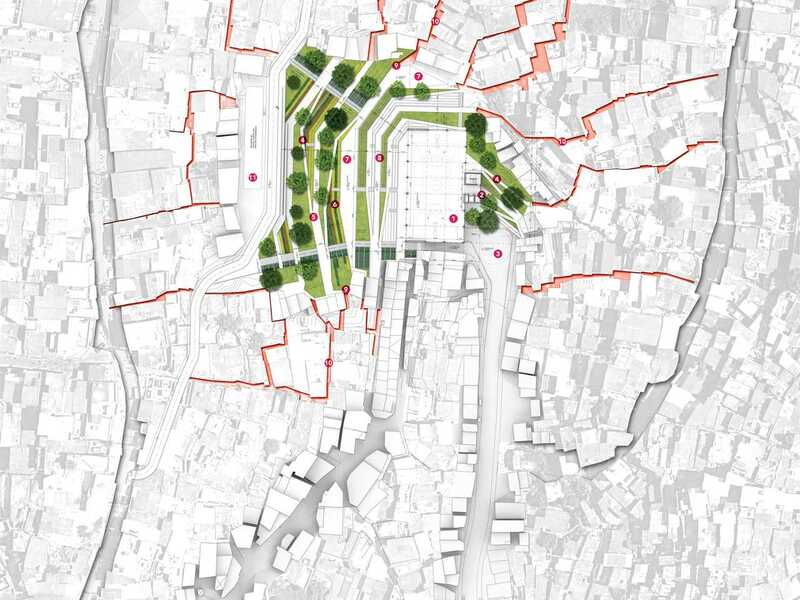 The jury selected this project because it is a very strong and important intervention in one of the most conflicted areas of São Paulo. 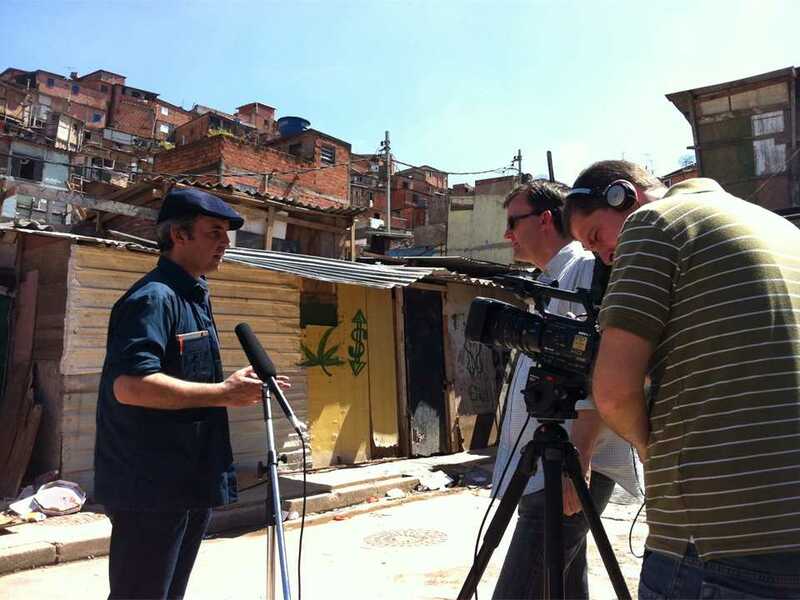 The proposed program has the complexity that brings satisfaction and opportunities to many of the people in the favelas. It provides social cohesion and additional jobs in a very efficient way, through the process of building a community center together. 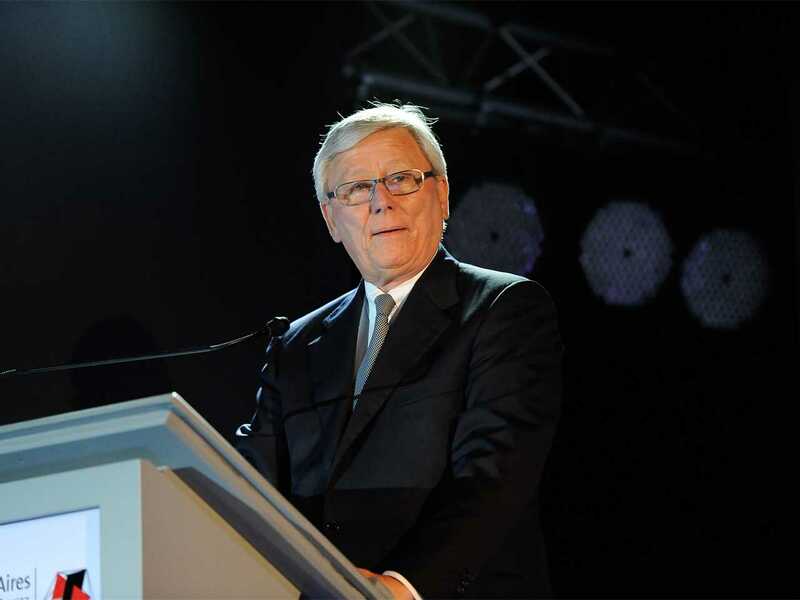 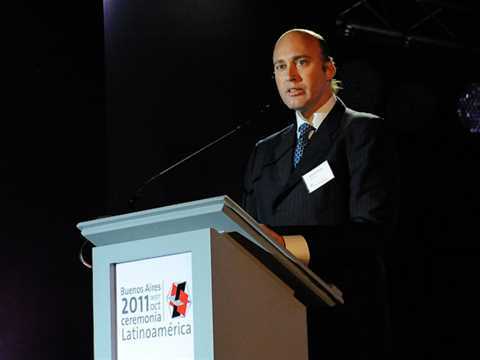 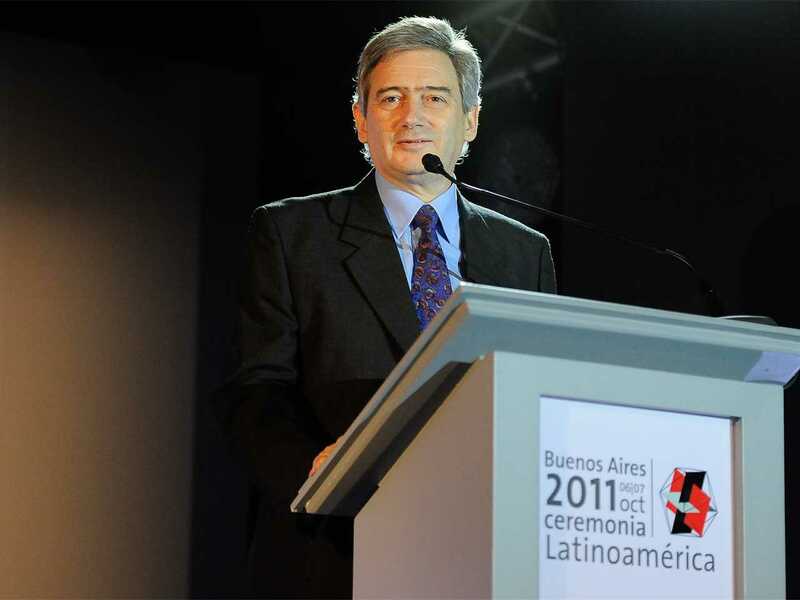 Bernard Fontana is Deputy Chairman of the Board of the Holcim Foundation, Chairman of the Steering Committee of the Holcim Foundation, and CEO of Holcim. 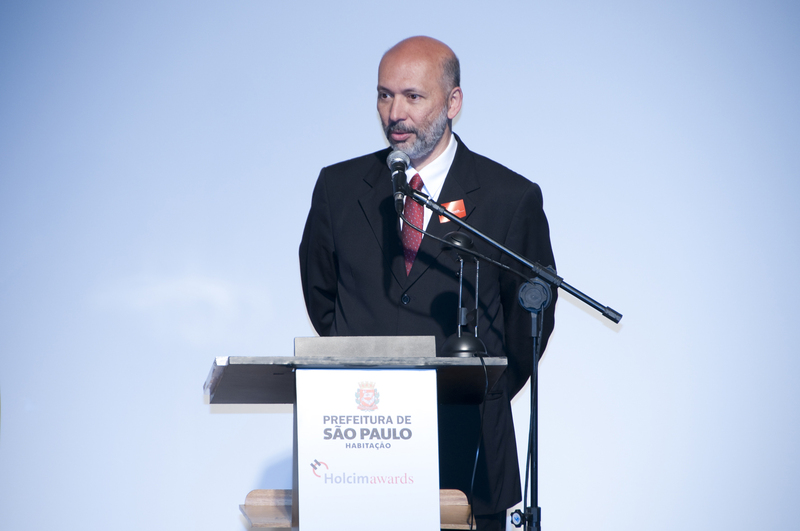 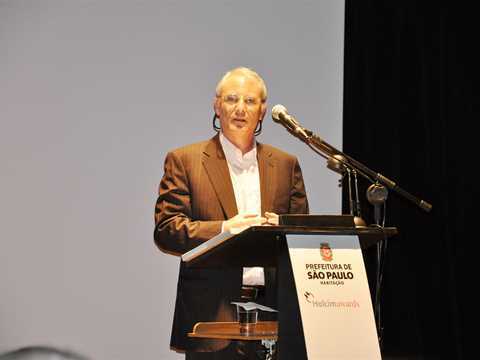 Joildo Santos, Presidente da União de Moradores e do Comercio de Paraisópolis (UMCP). Marcelo Takaoka, President of the Brazilian Council for Sustainable Construction (CBCS). 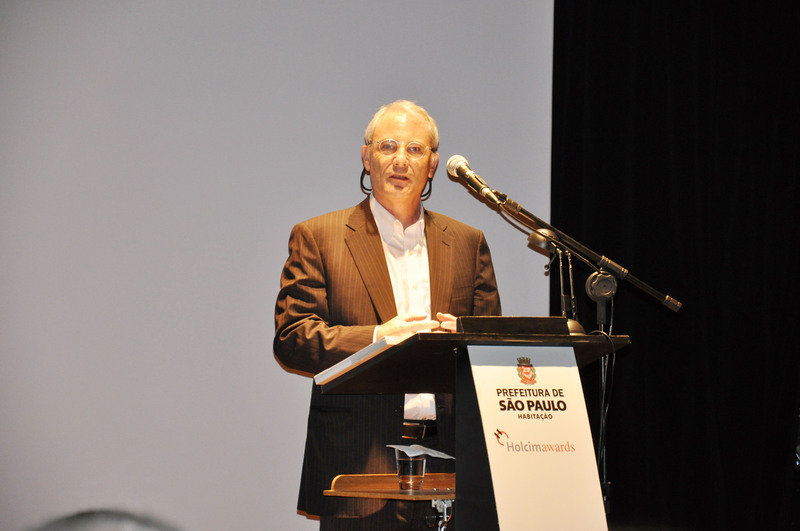 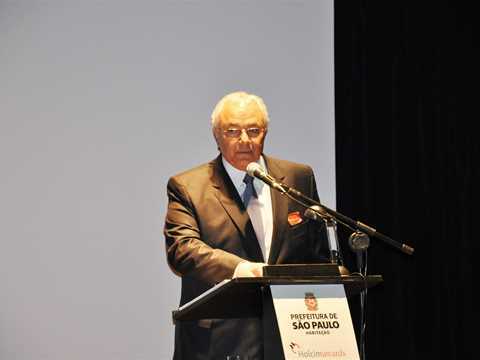 Paulo Simão, Presidente da Câmara Brasileira da Indústria da Construção (CBIC). Elisabete França, Sub-Secretária de Habitação da Cidade de São Paulo (SEHAB). 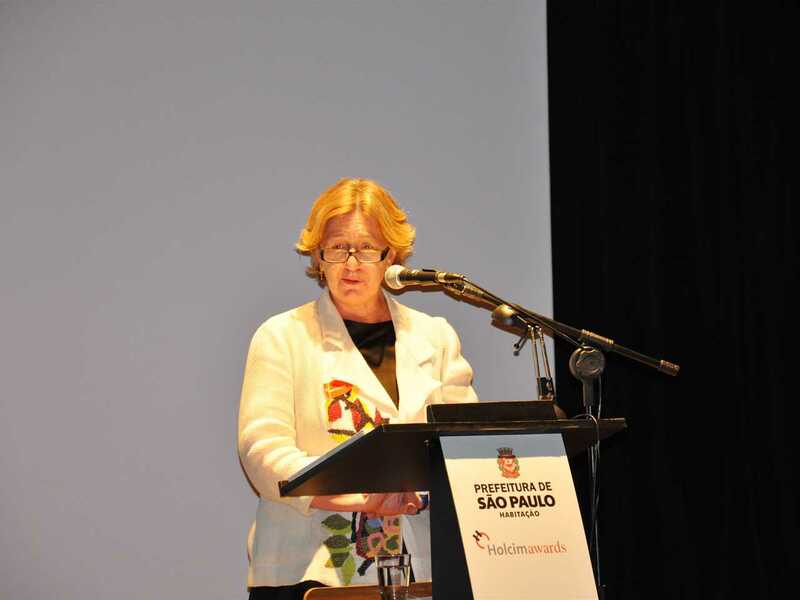 Maria Tereza Diniz, Coordenadora de Projeto, Paraisópolis, SEHAB. 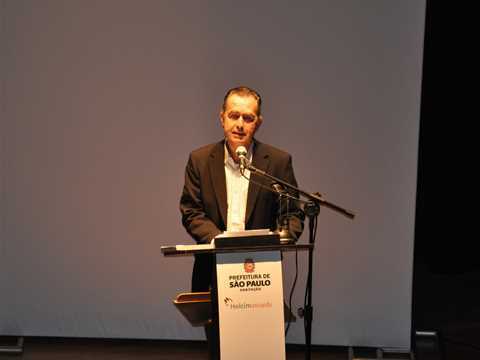 Gilberto Kassab, Mayor of the City of São Paulo. 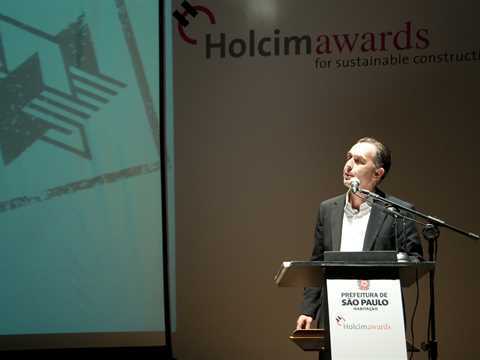 Otmar Hübscher, CEO, Holcim Brazil. 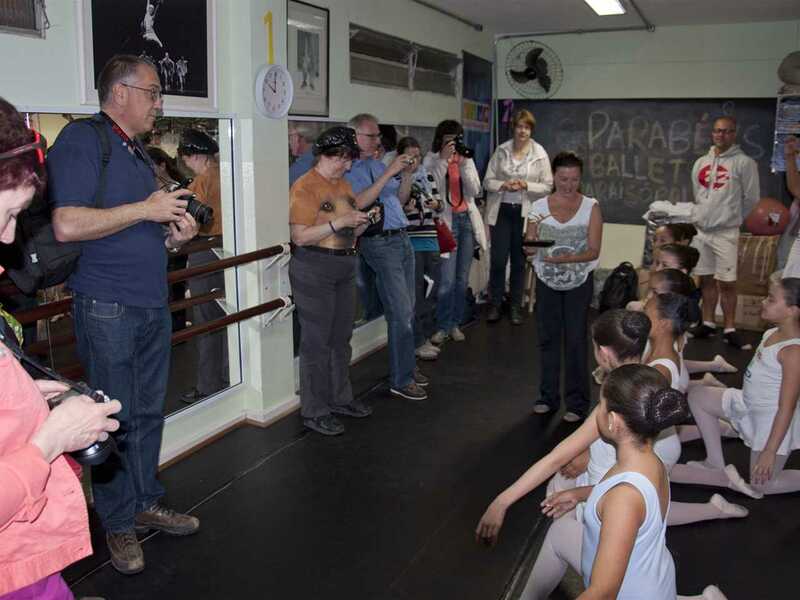 Paraisópolis Youth Ballet – the group will benefit from the new civic infrastructure hub where they will be able to use spaces established and reserved for their activities on a permanent basis. 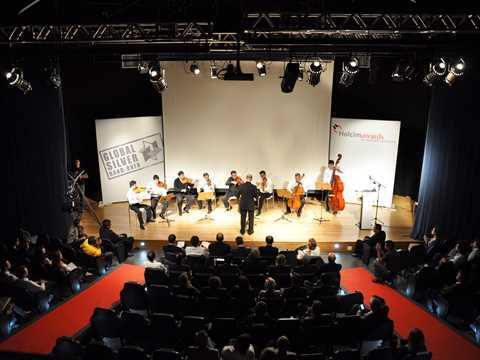 Paraisópolis Youth Orchestra – the group will benefit from the new civic infrastructure hub where they will be able to use spaces established and reserved for their activities on a permanent basis. 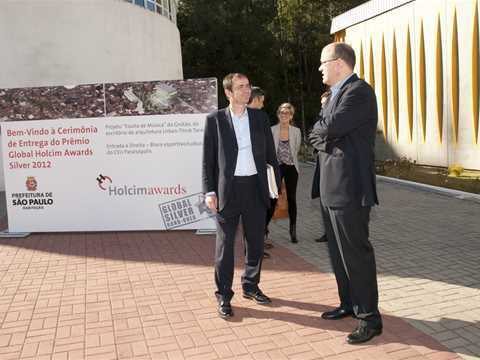 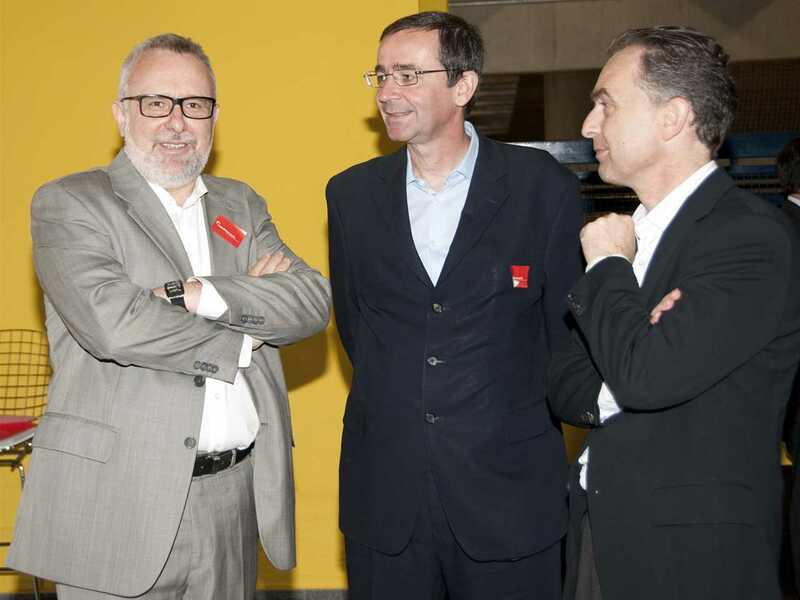 Holcim representatives (l-r): Bernard Fontana, CEO of Holcim and Chairman of the Steering Committee of the Holcim Foundation and Andreas Leu, Member of the Executive Committee of Holcim for Latin America. 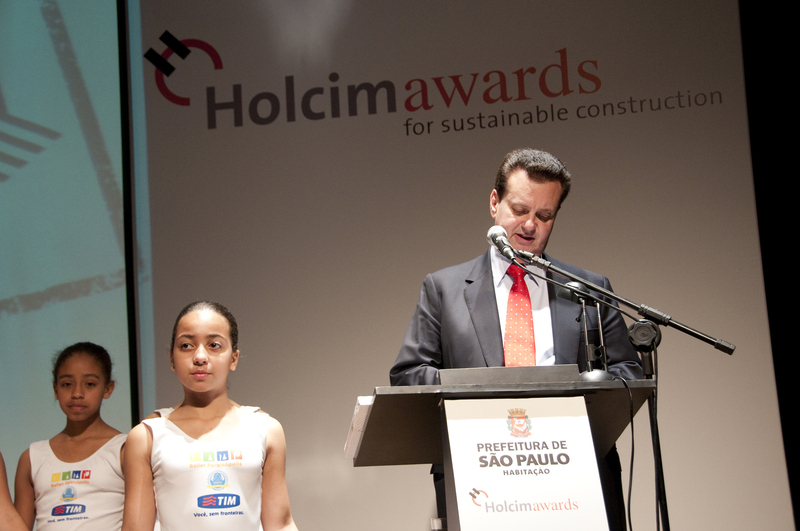 Attending the handover event (l-r): Vanderley M John, Associate Professor, Department of Civil Construction Engineering, Polytechnic School, Universidade de São Paulo (USP), Brazil – and member of the Global Holcim Innovation prize 2012 jury and Holcim Awards 2011 jury for Latin America; Bernard Fontana, CEO of Holcim and Chairman of the Steering Committee of the Holcim Foundation; and Otmar Hübscher, CEO of Holcim Brazil. 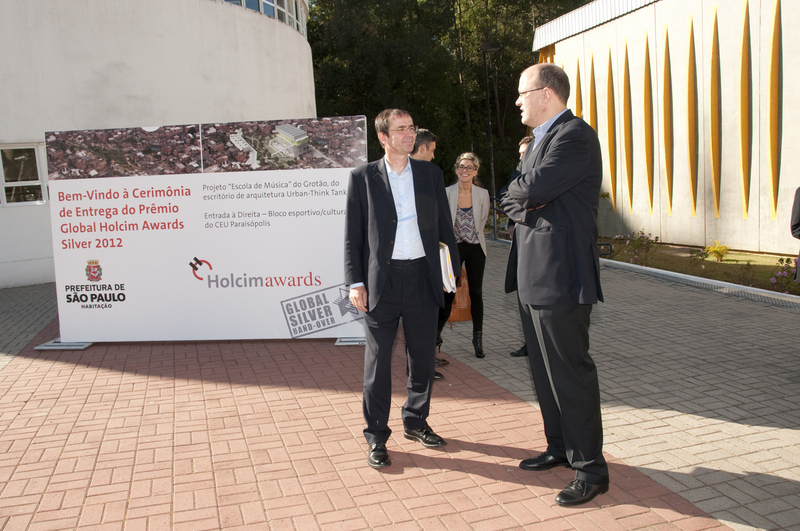 Bernard Fontana (right), CEO of Holcim and Chairman of the Steering Committee of the Holcim Foundation pictured during a media interview at the handover event. 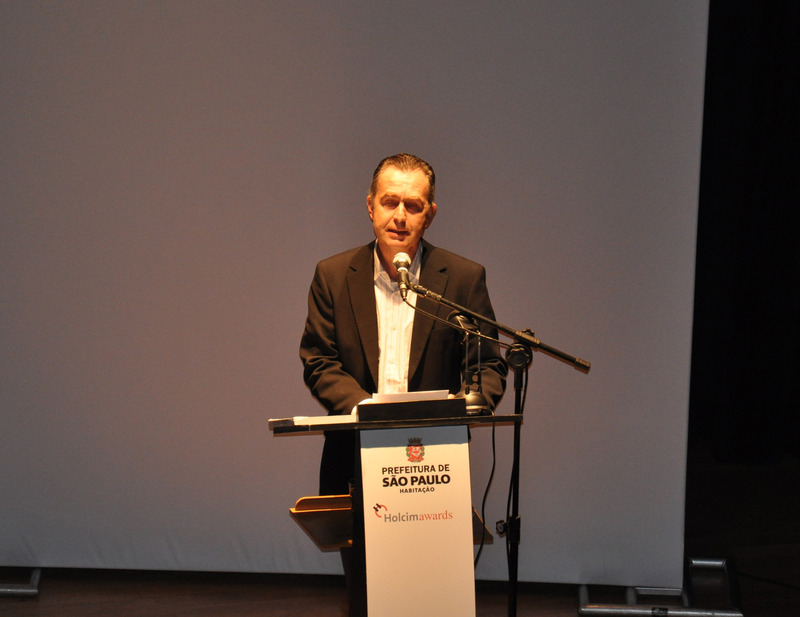 Master of ceremonies, Stephan Buser, Swiss-Brazilian chamber of commerce. Maestro Paulo Rydlewski, conductor of the Paraisópolis Youth Orchestra, not only performed with some of his gifted students, he also gave thanks for the new building where the orchestra will be able to use spaces established and reserved for its activities on a permanent basis. 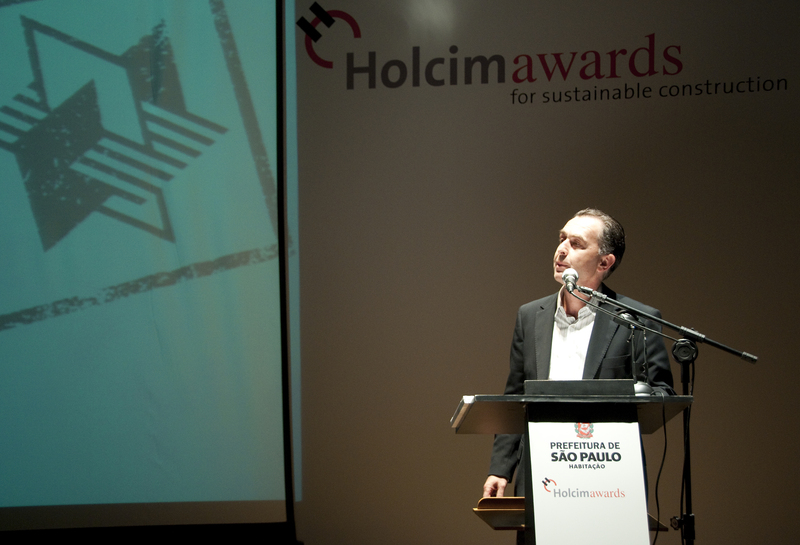 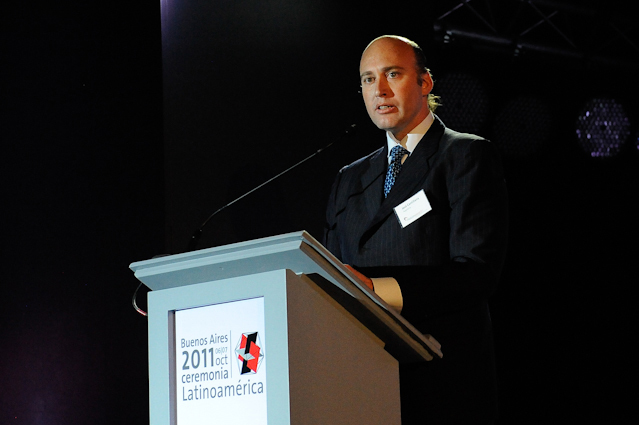 Otmar Hübscher, CEO of Holcim Brazil. 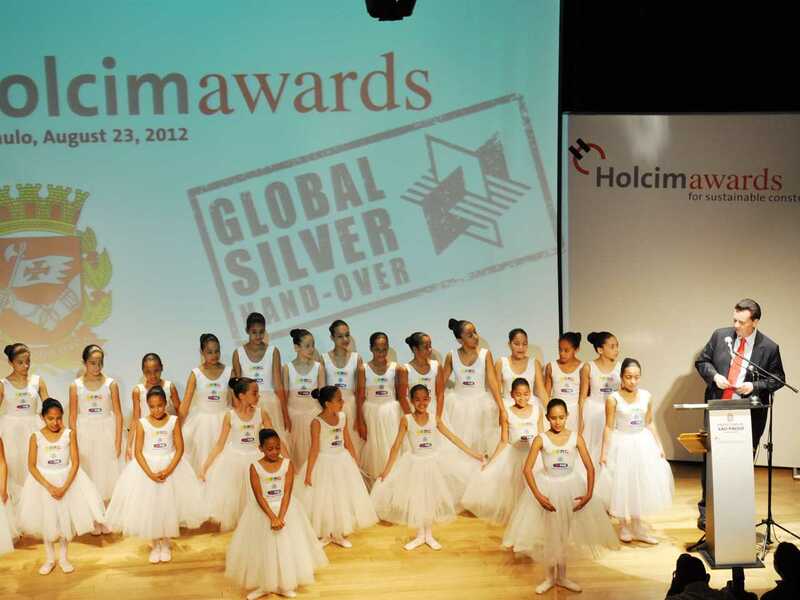 “Escola de Música” in the community of Paraisópolis in São Paulo was selected to receive the Global Holcim Awards Silver 2012 out of more than 6,000 competition entries from all over the world. 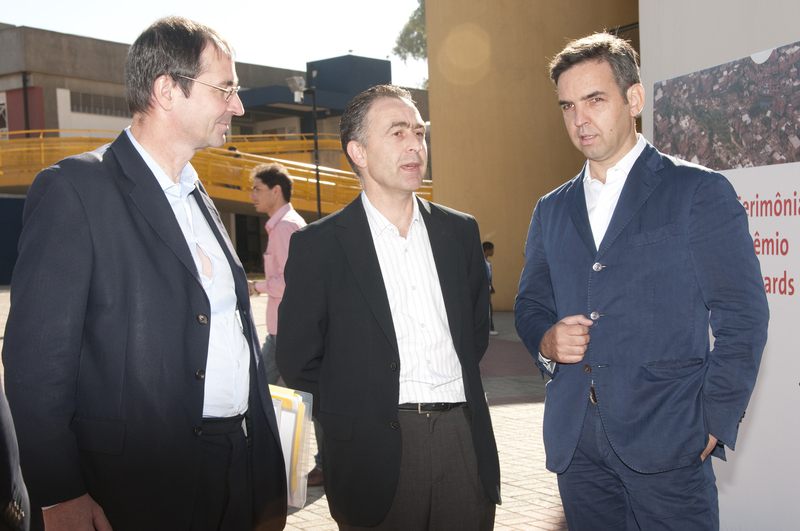 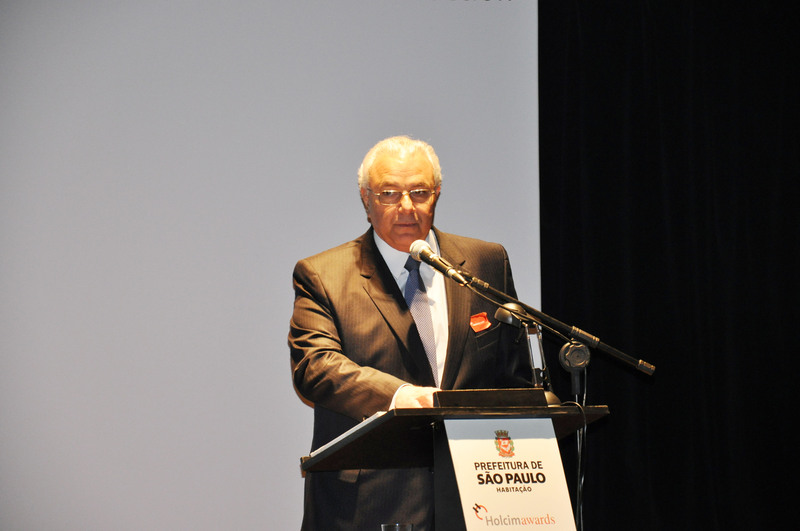 The speakers at the prize handover event at CEU included Gilberto Kassab, Mayor of São Paulo, Elisabete França, Deputy Secretary of Housing of the City of São Paulo, and Joildo Santos on behalf of the Paraisópolis community. 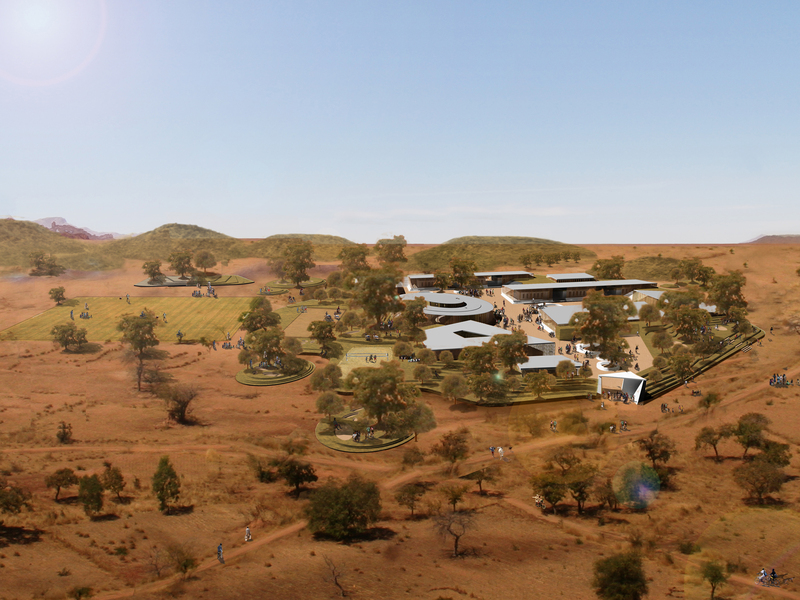 The internationally-acclaimed project expands sustainability beyond the management of natural resources and into the realm of social sustainability. 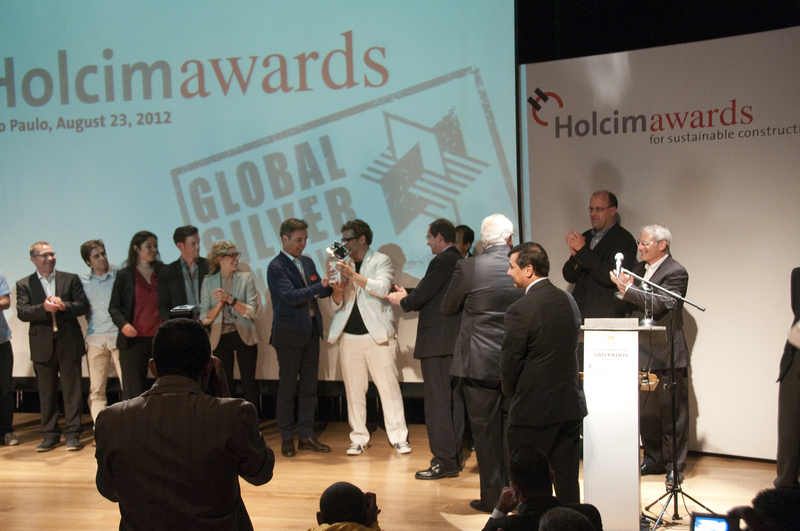 The Global Holcim Awards Silver 2012 was presented to architects Alfredo Brillembourg (Venezuela/Switzerland), Hubert Klumpner (Austria/Switzerland) and their multinational design team at Urban-Think Tank (U-TT), Brazil for an Urban remediation and civic infrastructure hub: Grotão – Fábrica de Música (music school). The project will include a terraced public space with areas for urban agriculture, a water management system, a public amphitheater, a music school, a small concert hall, sports facilities, public spaces and transport infrastructure. It will prevent further erosion and dangerous mudslides on the steep slopes and provide social and cultural infrastructure. 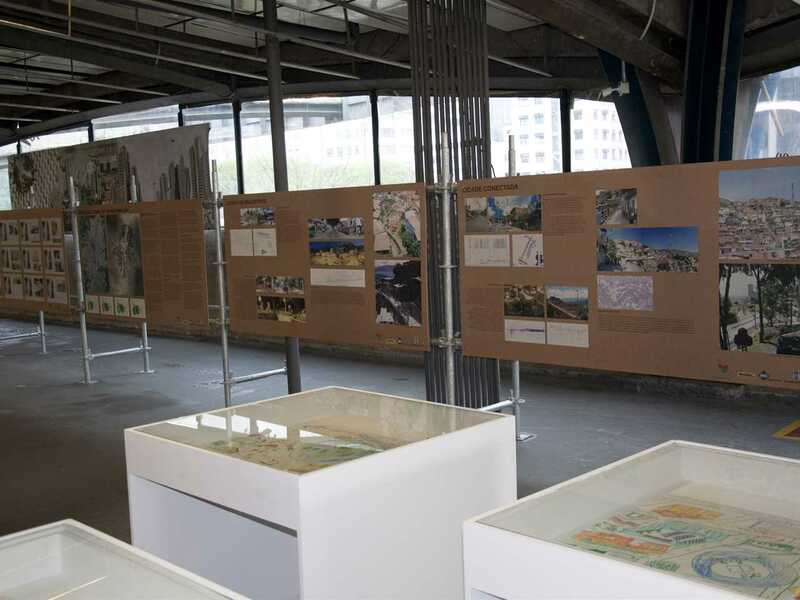 The project was praised for its unifying concept, premium cultural facilities, architectural quality, and integrated involvement of the local community in a socially-inclusive planning and management approach. Aaron Betsky (USA), Director of the Cincinnati Art Museum, and representative of the Global Holcim Awards jury, explained how the infrastructure hub would address environmental challenges. 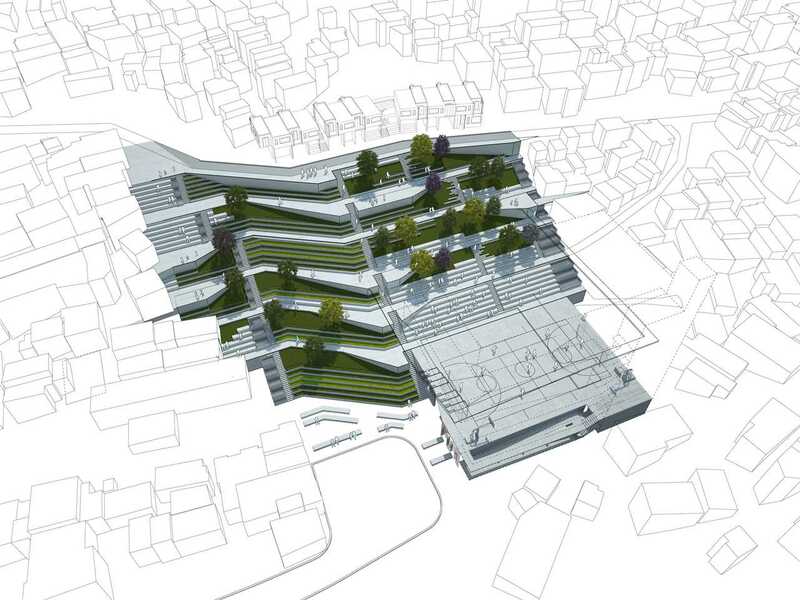 “The project structure retains and stabilizes the area’s challenging topography, creating a green island in a terraced public space,” he said. 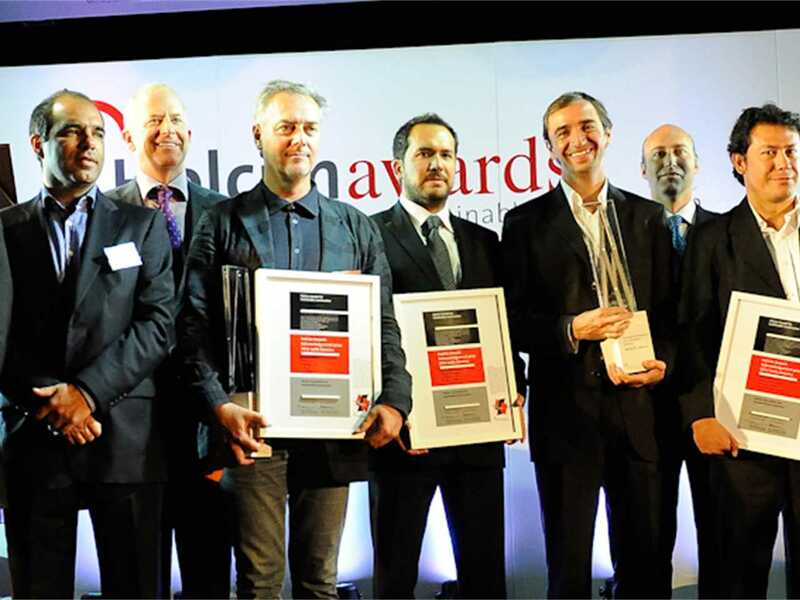 Holcim CEO, Bernard Fontana (Switzerland), congratulated the prize winners for applying architectural quality and contextual awareness to the project. 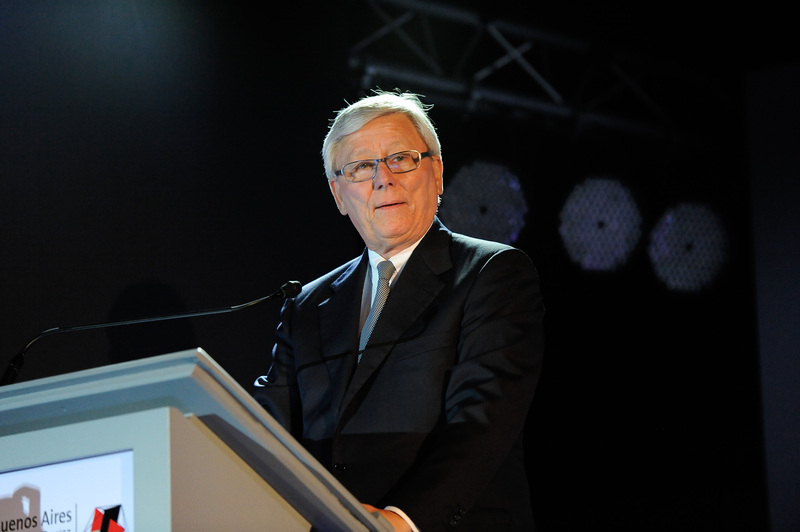 “We see sustainability not as a technical challenge but as a professional attitude of all building professionals that leads to a higher quality of life – in developing countries, emerging economies, and industrialized nations alike,” he said. Alfredo Brillembourg and Hubert Klumpner presented their winning project to around 200 attendees, and explained the inter-linkage between the various elements of the urban remediation concept. 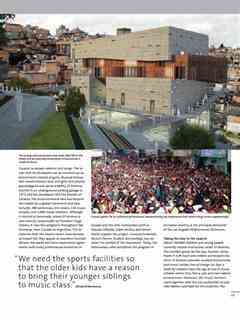 “We need the sports facilities so that the older kids have a reason to bring their younger siblings to music class,” they said. The project aims to contribute to the formation of a socially-viable environment by providing public space for productive community engagement, which will deliver enhanced opportunities to the many inhabitants of the favela. 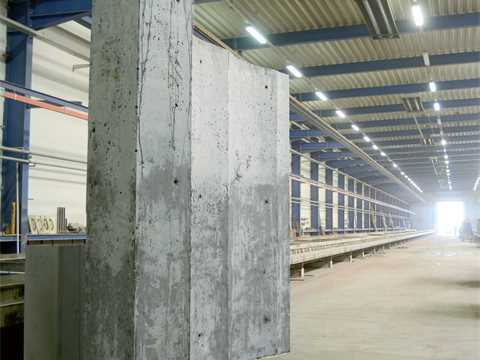 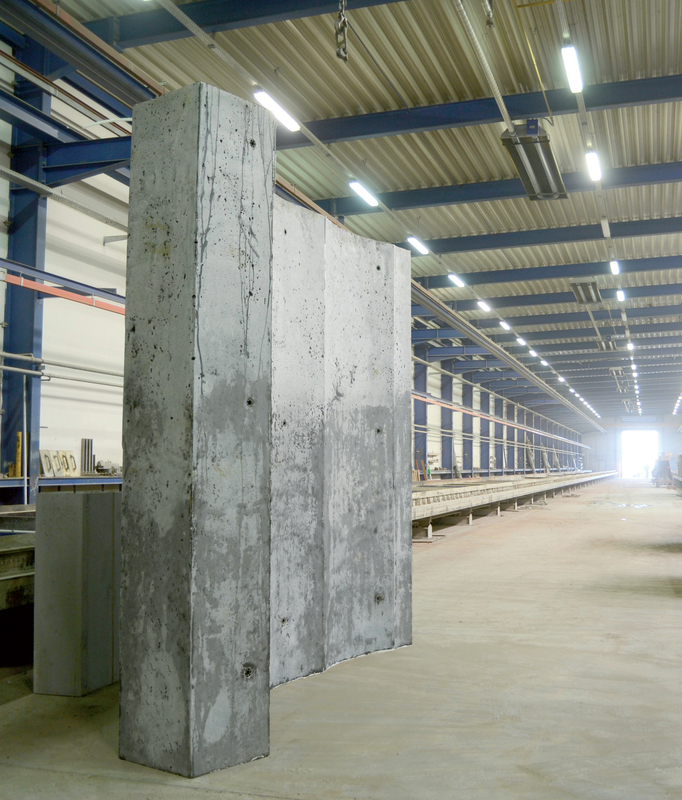 In the regional phase of the Holcim Awards 2011, this project won gold for Latin America and thereby qualified for the Global Holcim Awards competition. 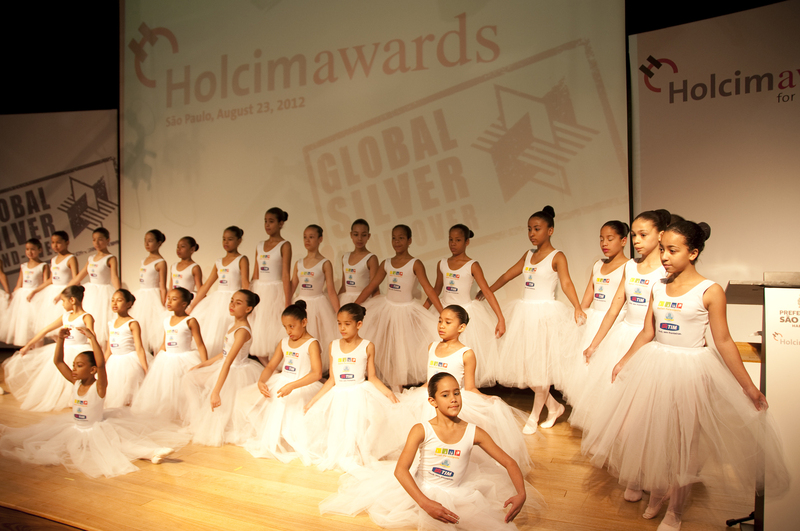 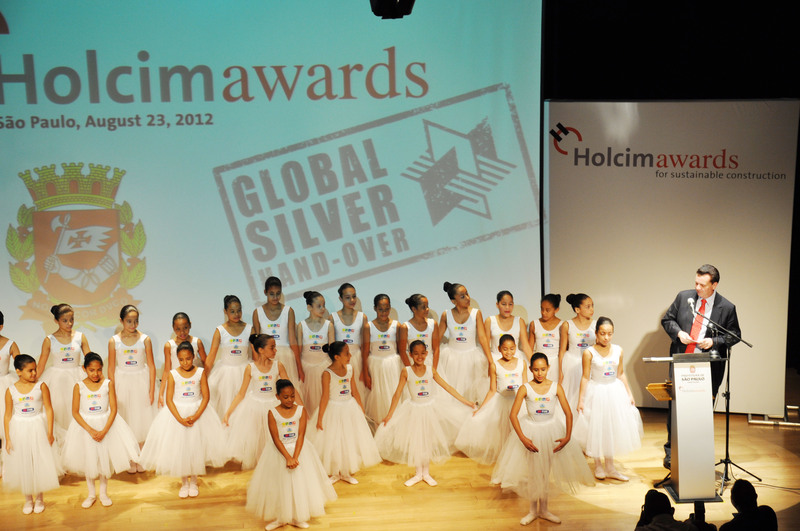 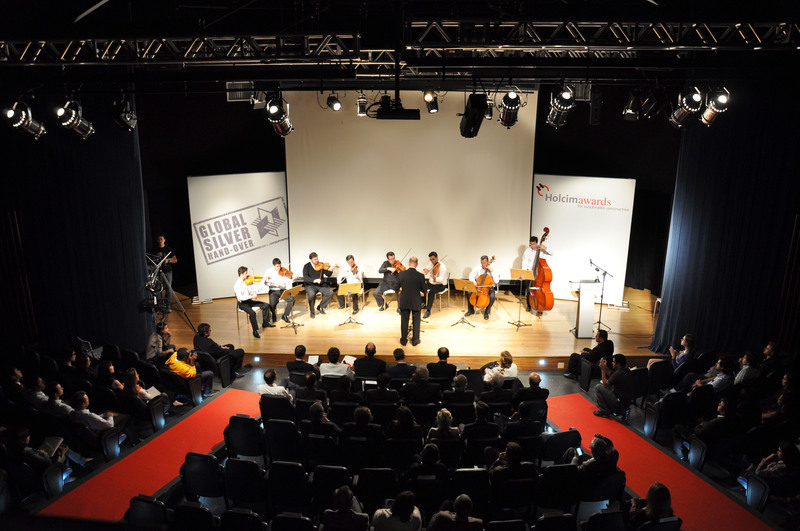 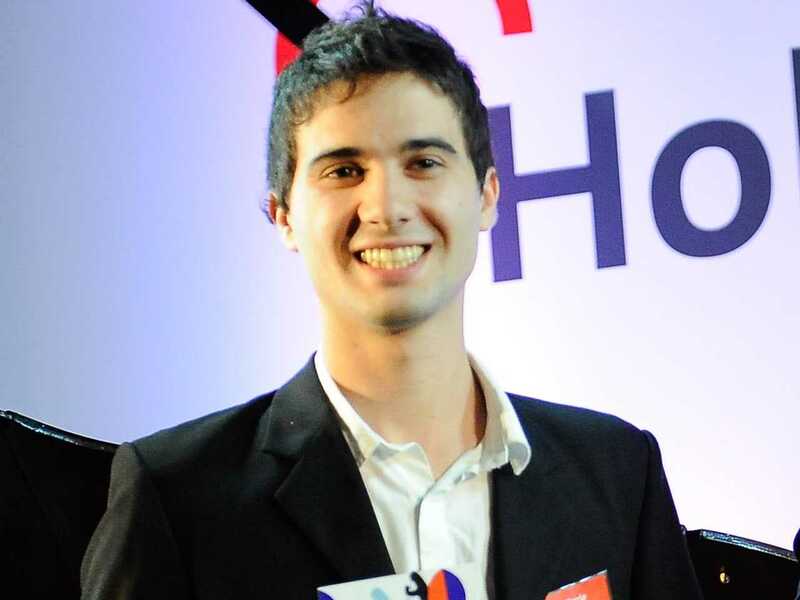 The prize hand-over ceremony was hosted by Holcim Brazil and featured musical entertainment by the Paraisópolis Youth Orchestra and a performance by the Paraisópolis Youth Ballet – both of which will benefit from the new civic infrastructure hub where they will be able to use spaces established and reserved for their activities on a permanent basis. 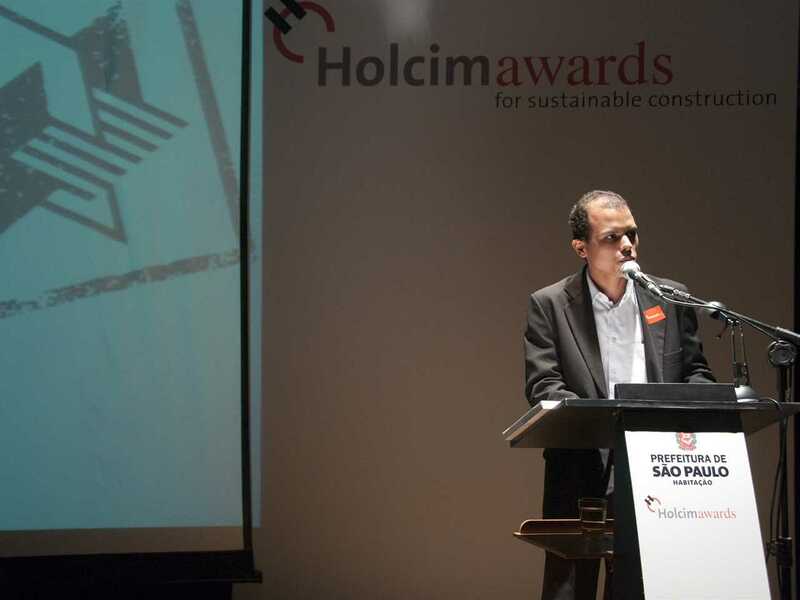 The merits of the project, however, go much further, as was highlighted in the speeches by Joildo Santos (Paraisópolis community), Marcelo Takaoka (CBCS), Paulo Simão (CIBIC), Elisabete França (SEHAB), Mayor Gilberto Kassab, and Otmar Hübscher (Holcim Brazil). The Global Holcim Awards Silver was awarded to a project that transforms an eroded landscape into a productive zone and dynamic public space. 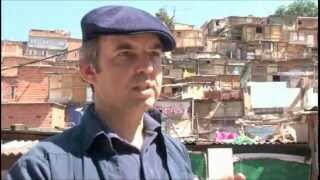 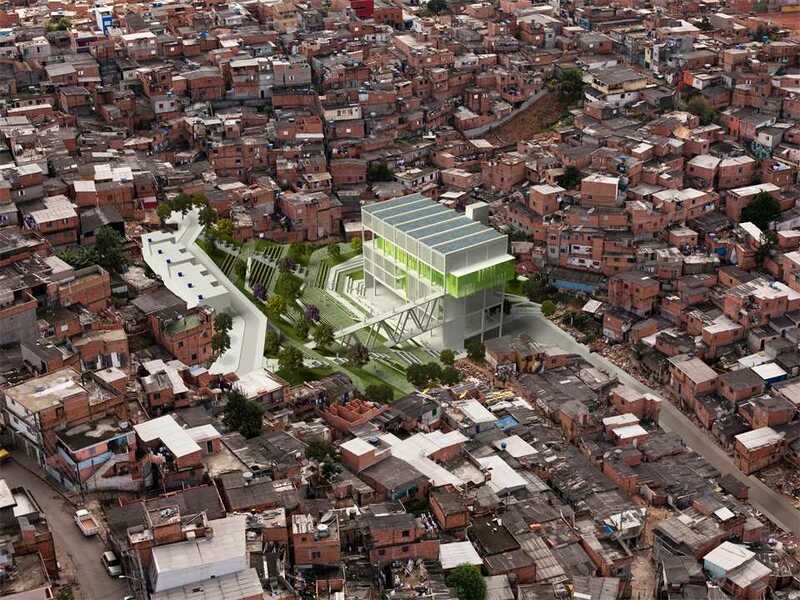 With about 100,000 inhabitants, the Paraisópolis favela in São Paulo is one of the world’s largest informal communities. The project led by architects Alfredo Brillembourg and Hubert Klumpner of Urban Think Tank, Brazil, includes a terraced public space with areas for urban agriculture, a water management system, a public amphitheater, a music school, a small concert hall, sports facilities, public spaces and transport infrastructure. 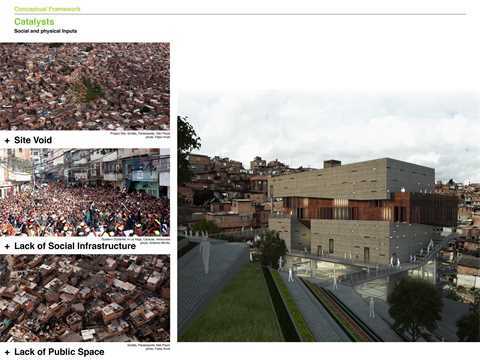 It prevents further erosion and dangerous mudslides on the steep slopes and provides social and cultural infrastructure. A multifunctional public building in the Paraisópolis favela of São Paulo, Brazil won the top prize of USD 100,000. 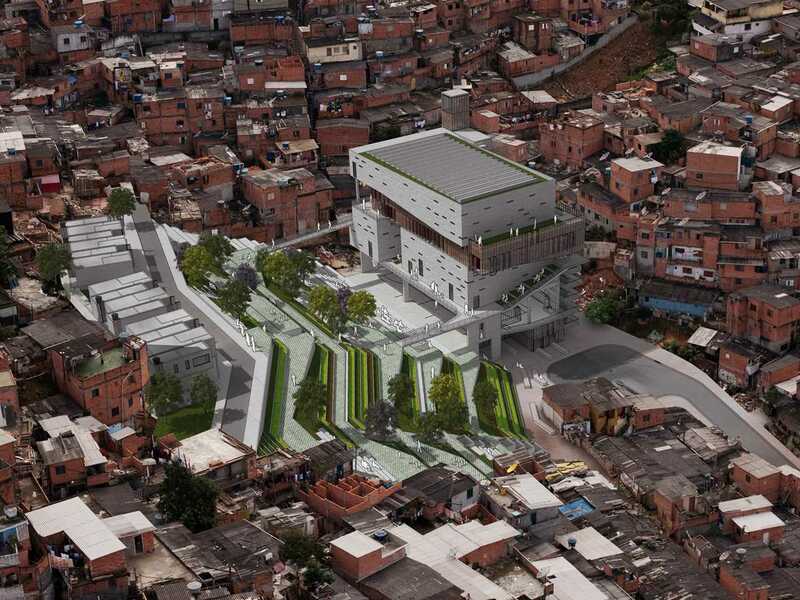 The Grotão – Fábrica de Música prevents further erosion and dangerous mudslides on the steep slopes and provides social and cultural infrastructure to a community which is effectively separated from the formal city. 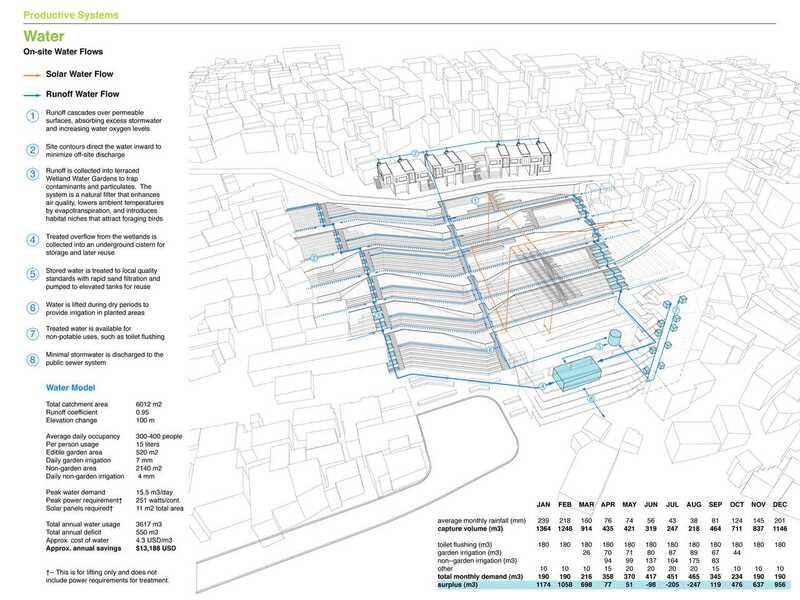 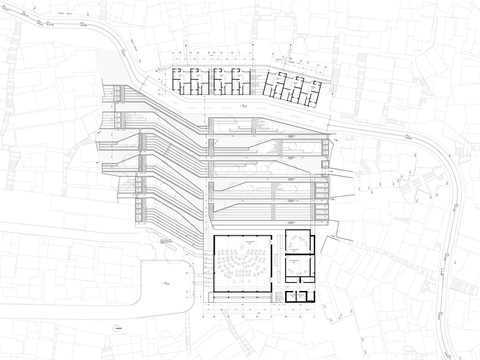 The project led by Alfredo Brillembourg of Urban Think Tank includes a terraced public space featuring areas for urban agriculture, a water management system, a public amphitheater, a music school, a small concert hall, sports facilities, public spaces and transport infrastructure. 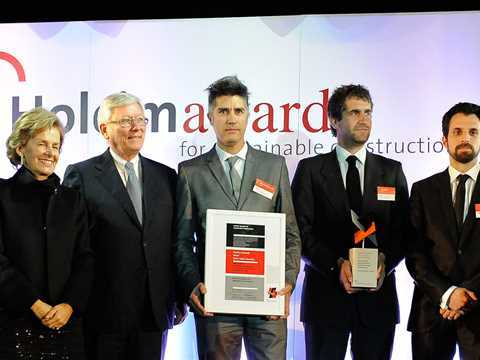 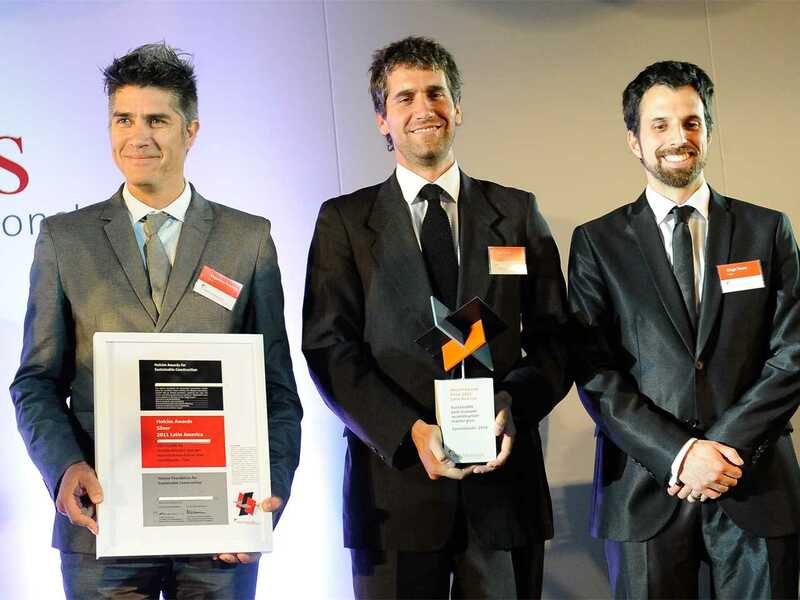 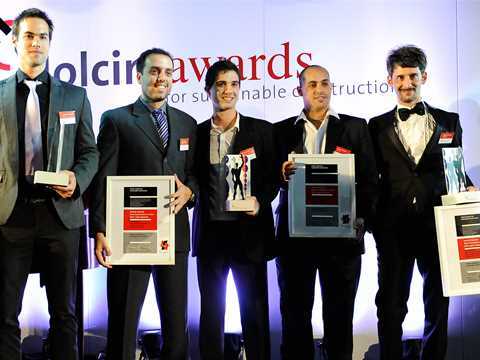 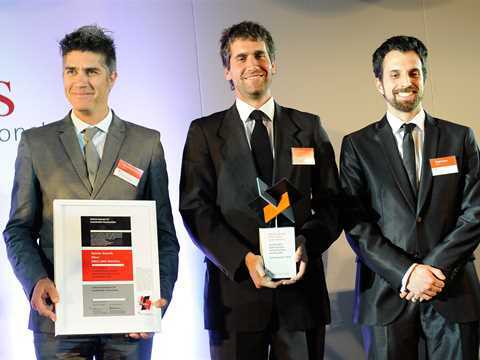 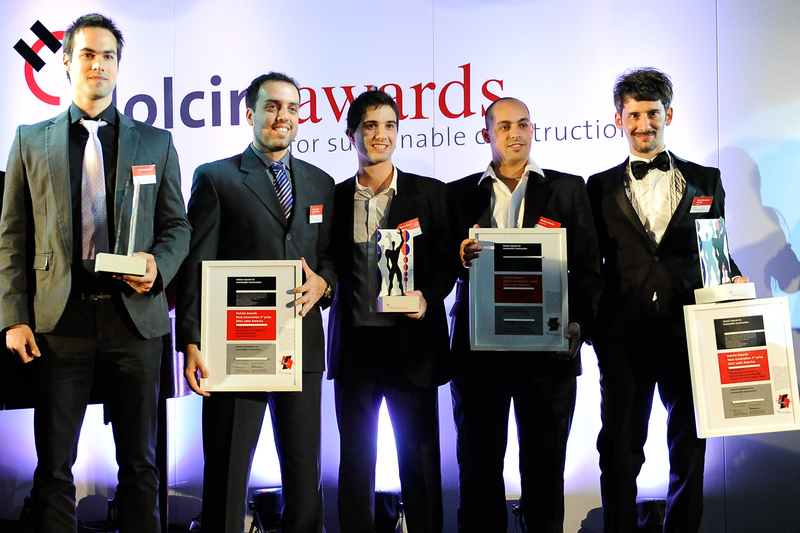 The winners of the 3rd International Holcim Awards competition for sustainable construction projects and visions from across Latin America have been announced. 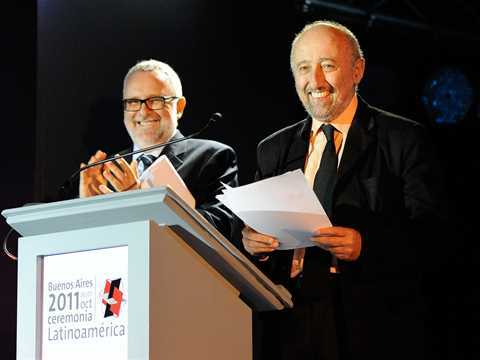 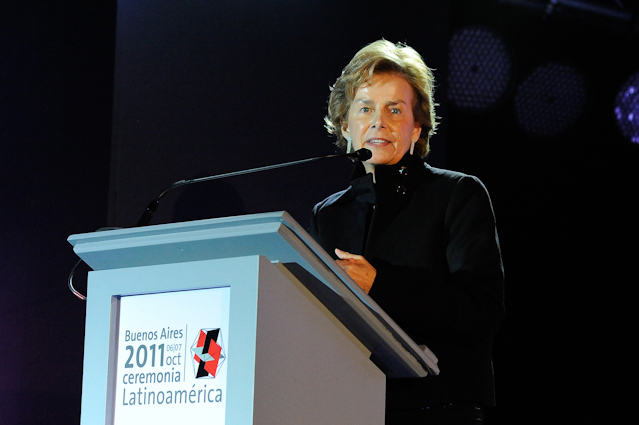 A total of USD 300,000 was presented to eleven outstanding projects at a ceremony in Buenos Aires. 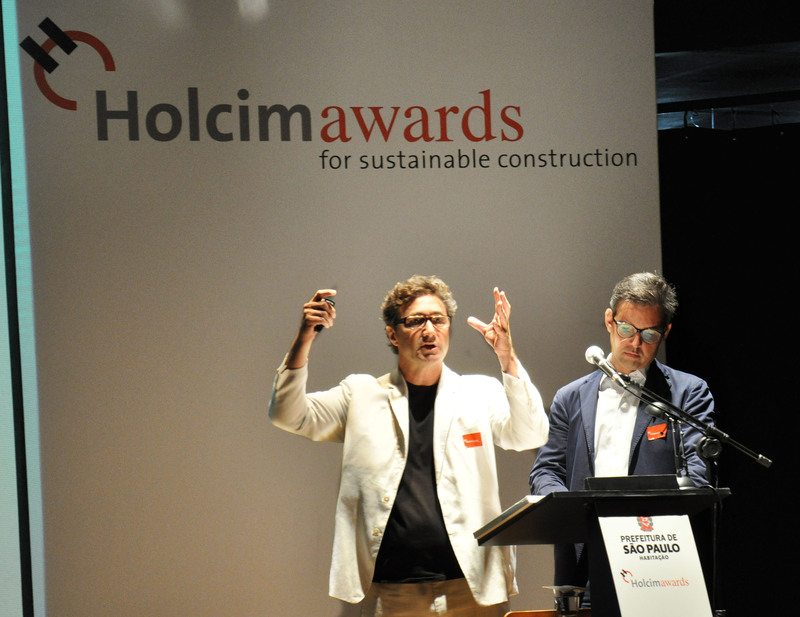 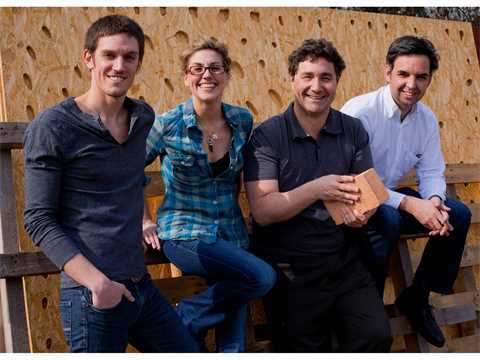 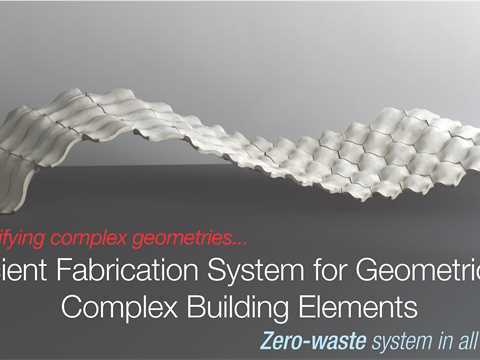 The jury appreciated the holistic approach, integrating all dimensions of sustainability on macro and micro scales. The urban approach of creating a vertical density within the low-rise sprawl of the favela, and allowing public spaces around, under and within the building, is of high quality. 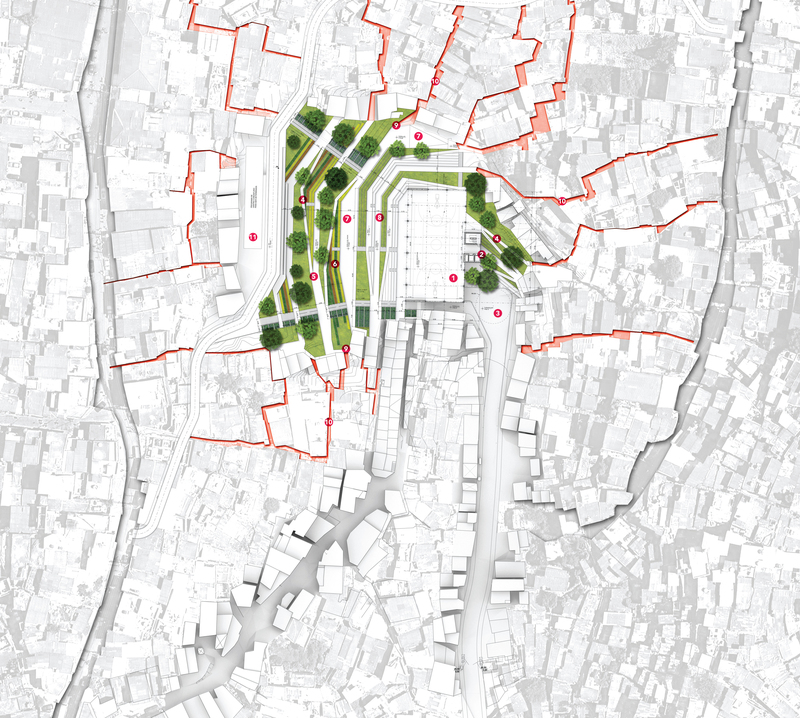 Through its integrative concept and introduction of cultural “high end” facilities with architectural quality, the project has the potential to contribute to an enrichment of social awareness and cohesion in the area. 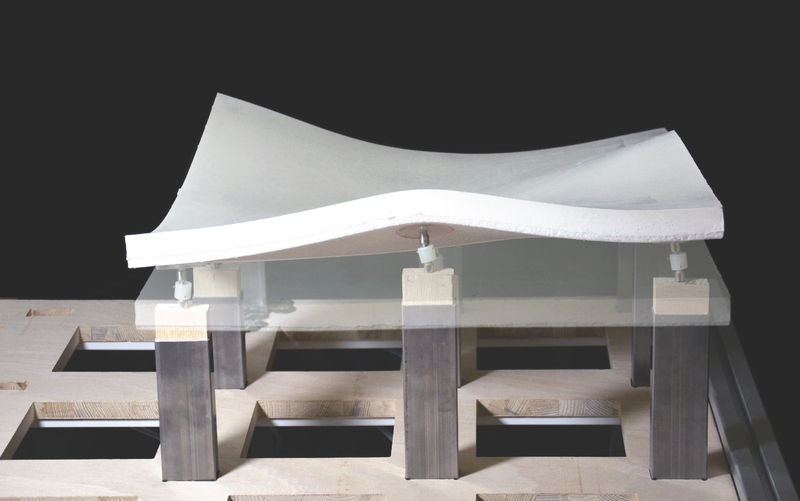 Furthermore, the appropriate application of technical features is of an exemplary and educative character. 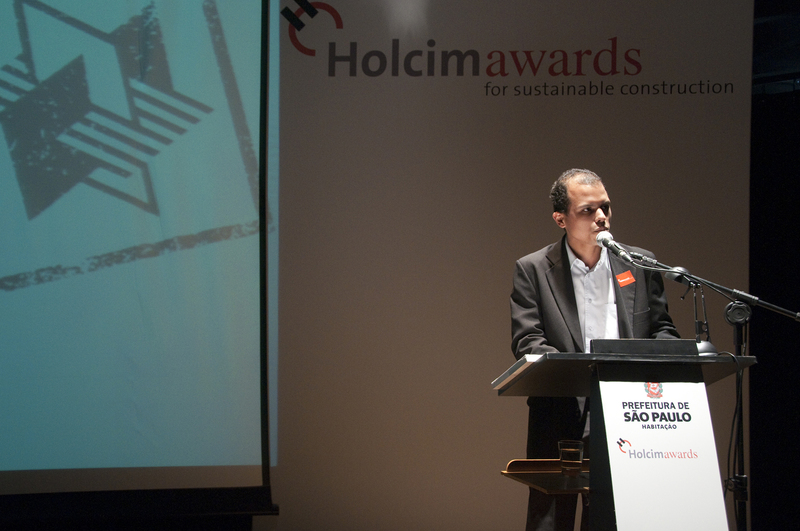 Grotão – Fábrica de Música was commended for its highly integrated involvement of the local community in a “bottom-up” planning and management approach. 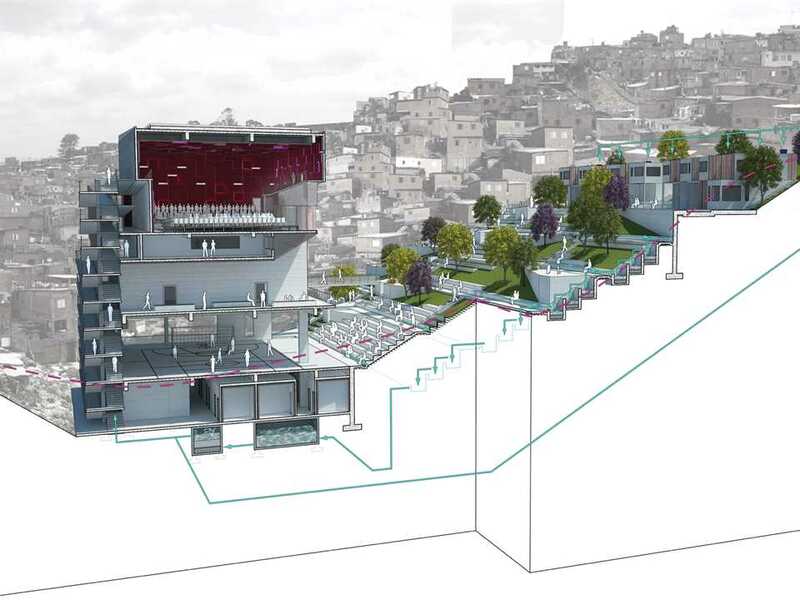 This project for a multifunctional public building, Grotão – Fábrica de Música (music factory), is located in Grotão in the heart of the Paraisópolis favela of São Paulo. With more than 100,000 inhabitants, it is one of the largest informal communities worldwide. 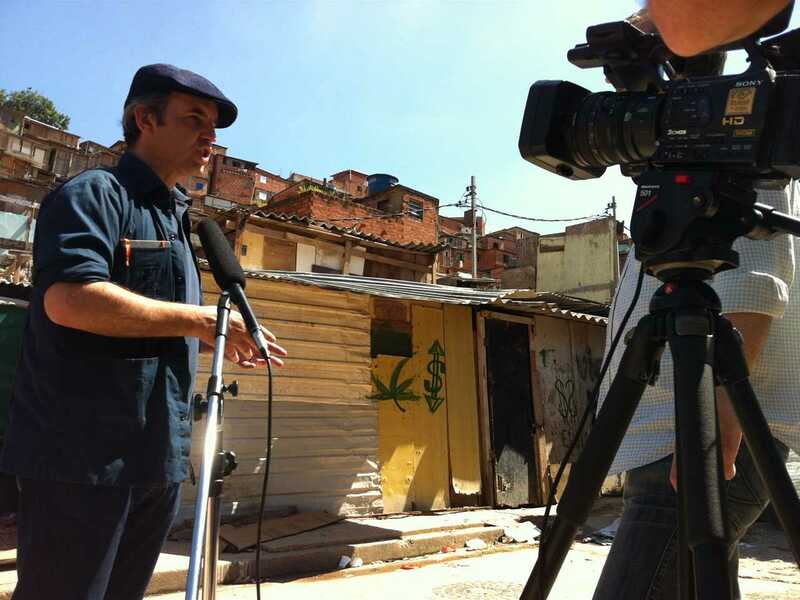 Like many favelas, and despite its unusually central location, the area is effectively separated from the formal city and its social and cultural infrastructure. In addition, due to the informal development and the area’s topographic and geological conditions, the site is characterized by increased erosion and dangerous mudslides. 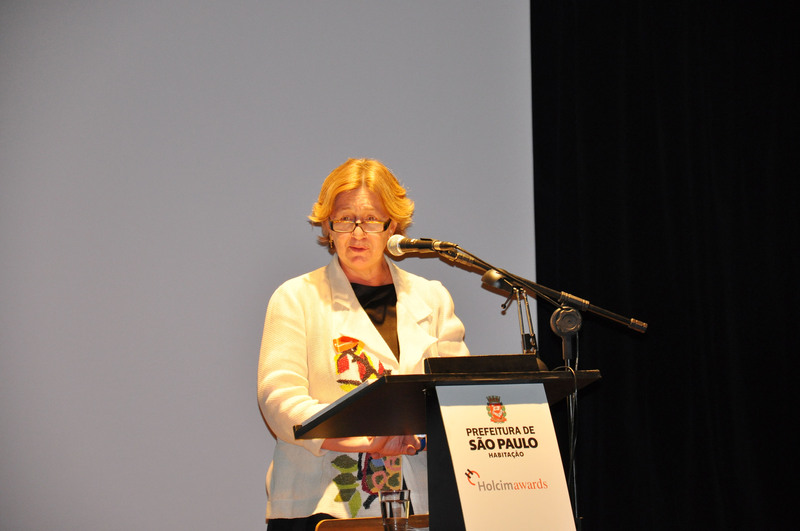 The project takes up both of these key challenges, building on intense community participation. 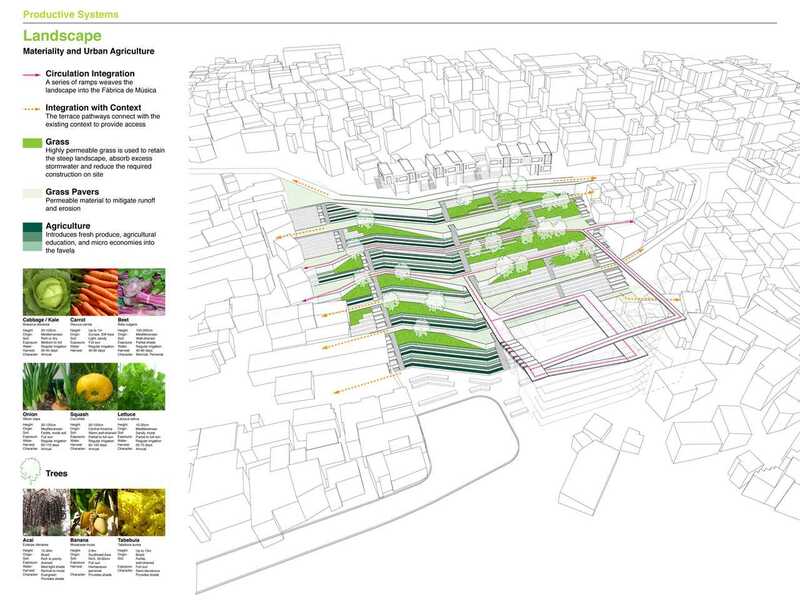 The challenging topography is retained and stabilized to prevent further erosion, creating a natural arena in a terraced public space and including a precinct for urban agriculture. 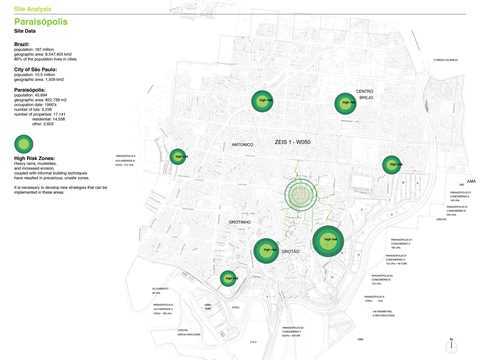 Different low-tech features are proposed. 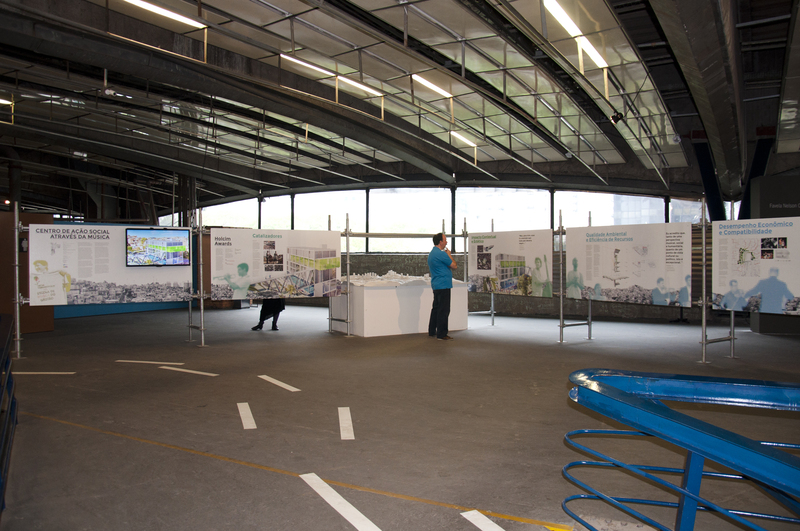 A water management system is introduced to use rainwater on site and reuse grey-water. An integrative system for the active and passive use of ventilation, cooling and air conditioning makes use of both, the building and the amphitheater construction. 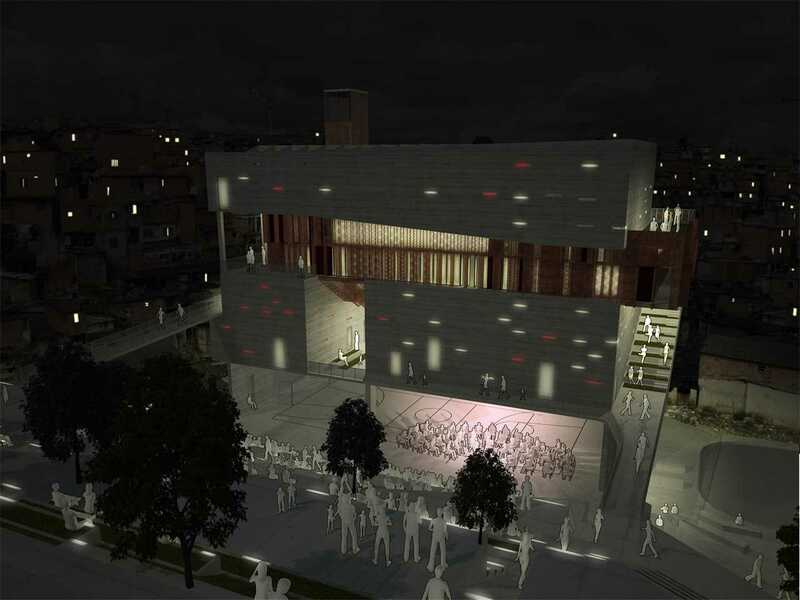 In its vertical structure, the building itself offers various spaces for the music school, including a small concert hall, and also sports facilities, public spaces, and transport infrastructure. 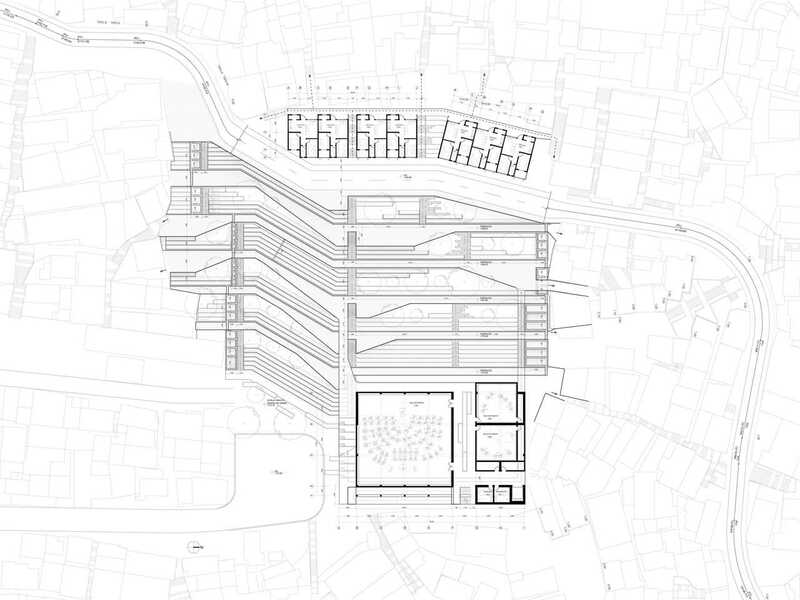 In the vicinity, residential buildings augment housing reserves and frame the arena.